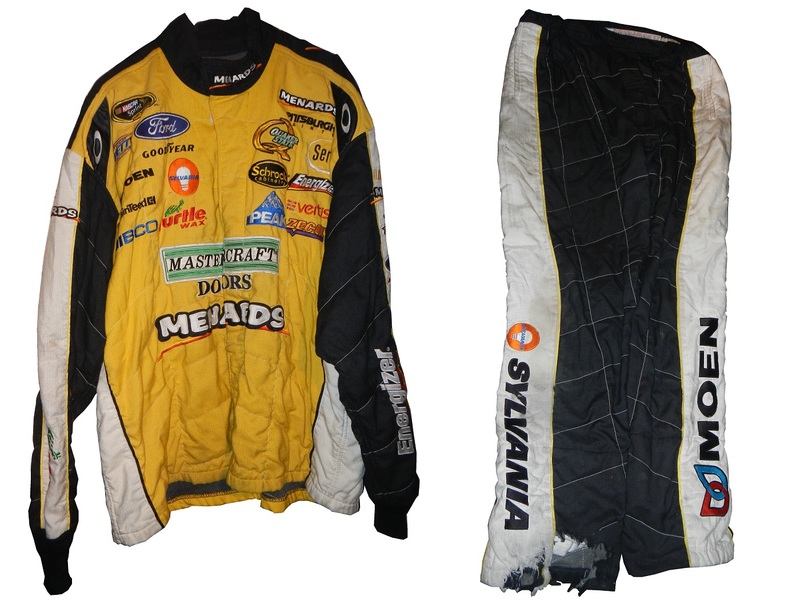 Pit crew member Tom Johansen was involved with this prototype suit from 2006. Gonna do a two for one this week. Two suits this week, in a good mood, gonna spread the love. 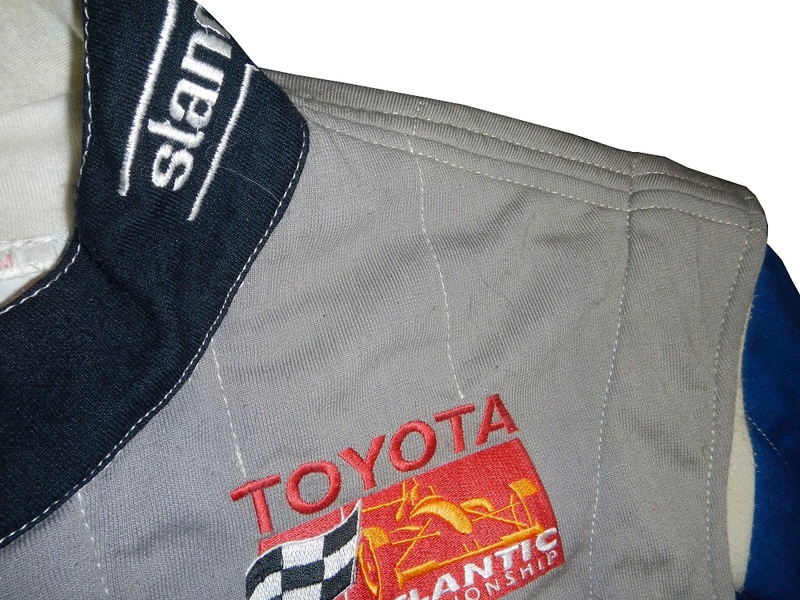 Our first week is my first Stand 21 suit, a 2000-2001 Toyota Atlantic series suit worn by Steve Lorenzen. The Toyota Atlantic Championship was a racing series in Champ Car that ran from 1977 to 1988 as the Formula Atlantic Championship. 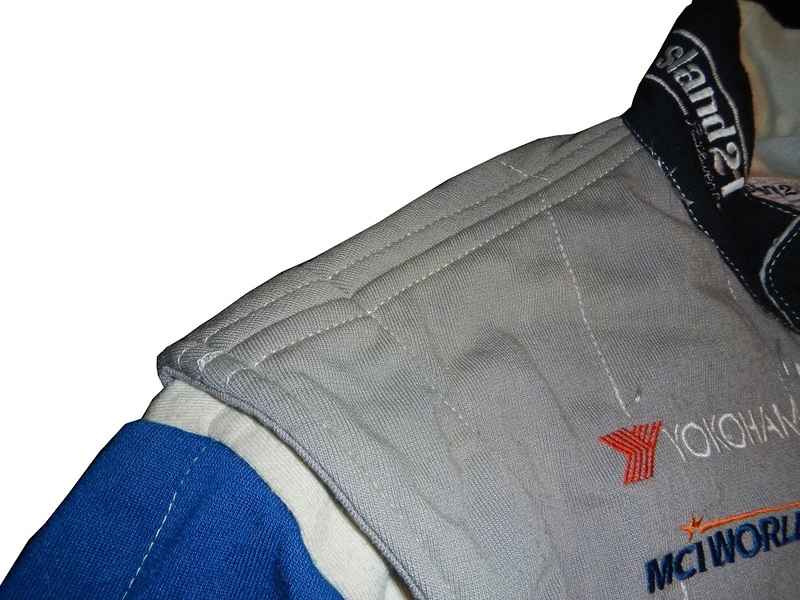 It then became part of Champ Car from 1989 to 2005, then it became Champ Car Atlantic from 2006-2007. 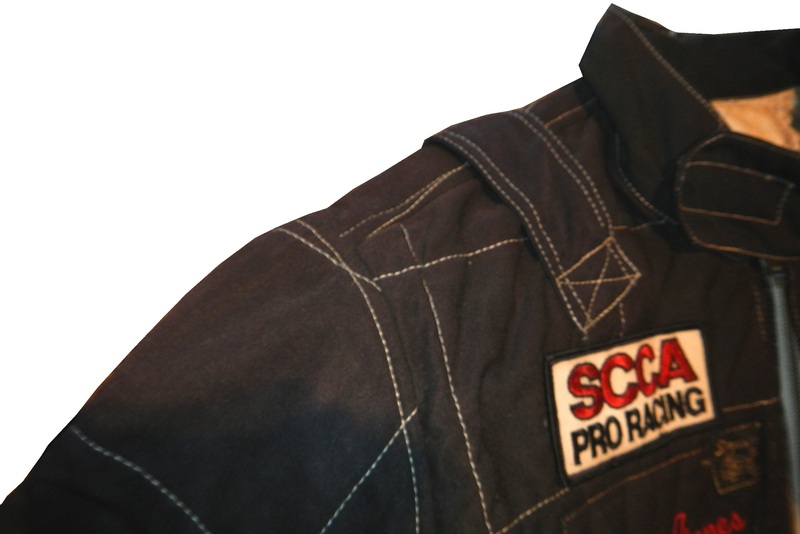 After than from 2008-2009 it was unaffiliated with any major racing series, and is currently on hiatus. 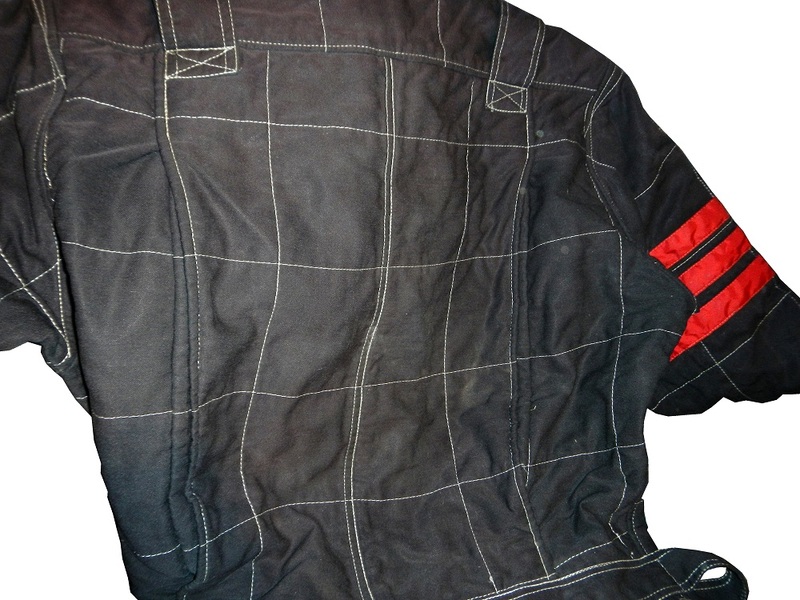 This particular suit was worn by driver Steve Lorenzen. 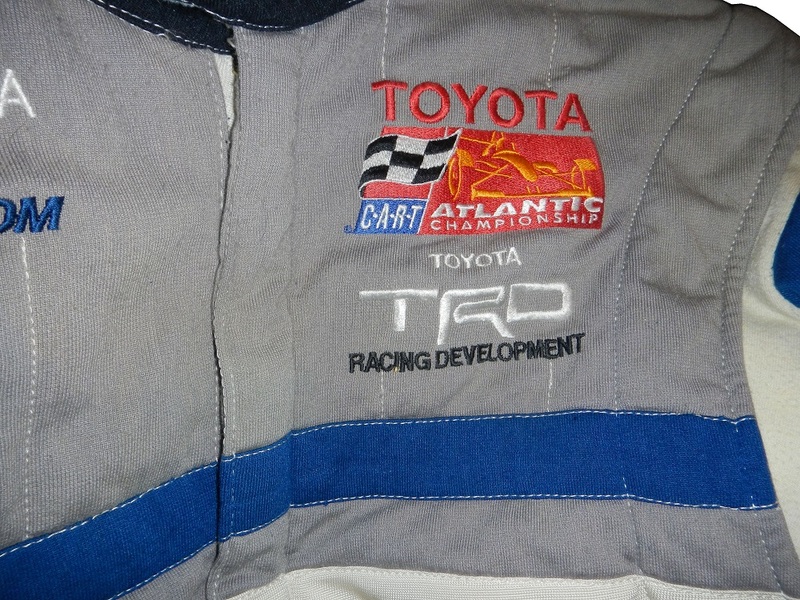 Lorenzen raced in the Toyota Atlantic Championship from 2000-2001 for 6 races in total. He did not have any success, and left the series after 2001. 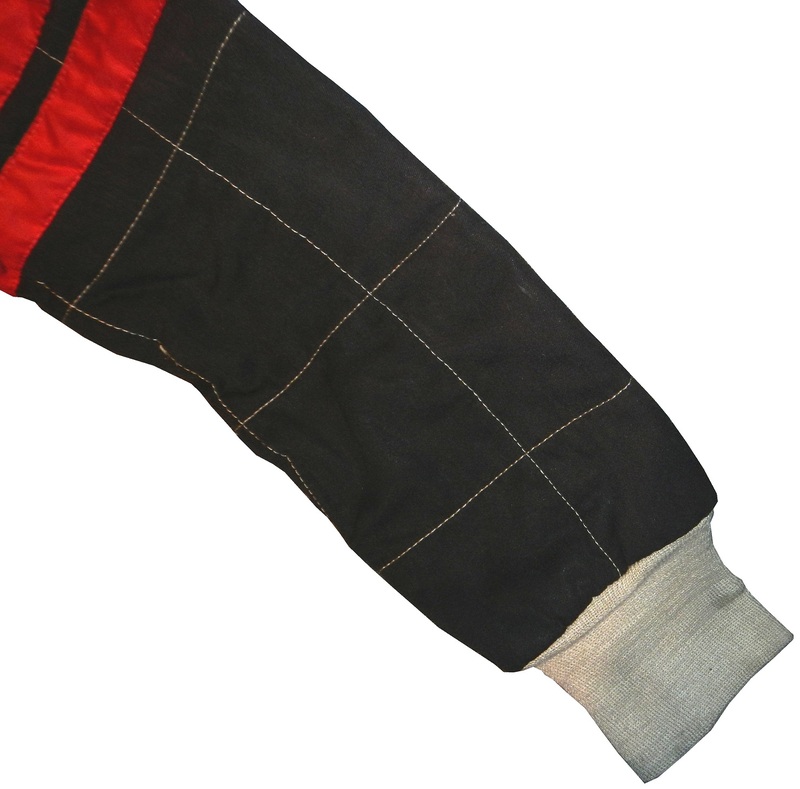 The suit shows light use, having been raced for only 6 races, and is FIA certified. 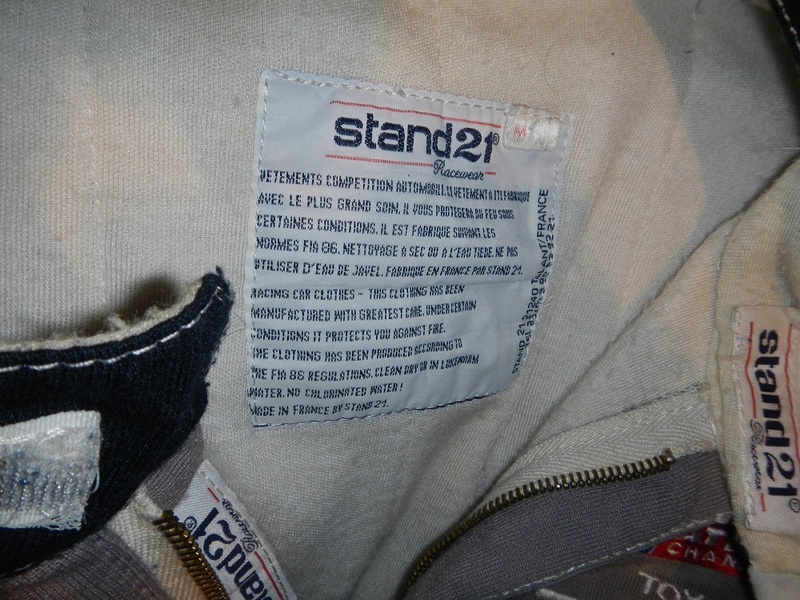 The collar has a Stand 21 logo on either side. 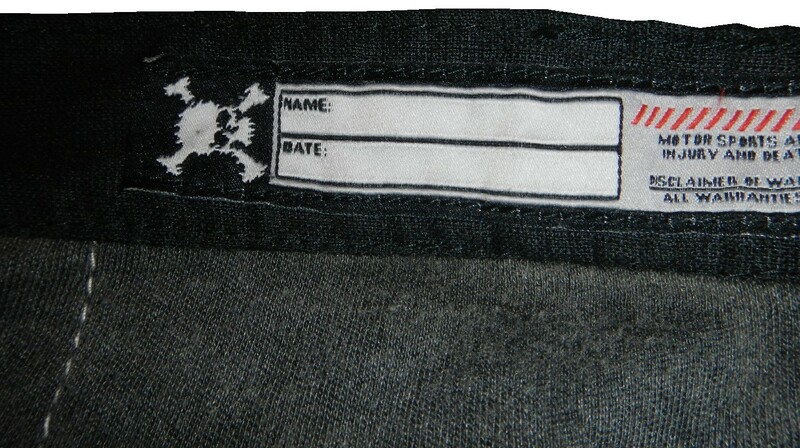 A warranty label is present on the inside of the collar in French and English. 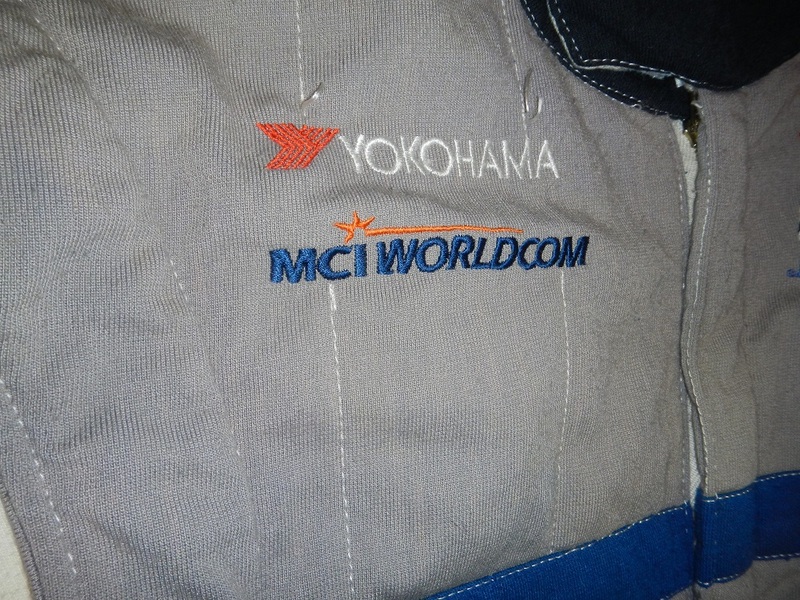 The front of the suit has a YOKOHAMA and MCI WORLD COM logo on the right side, and on the left is a TOYOTA ATLANTIC CHAMPIONSHIP logo, and nothing except stripes on the torso. 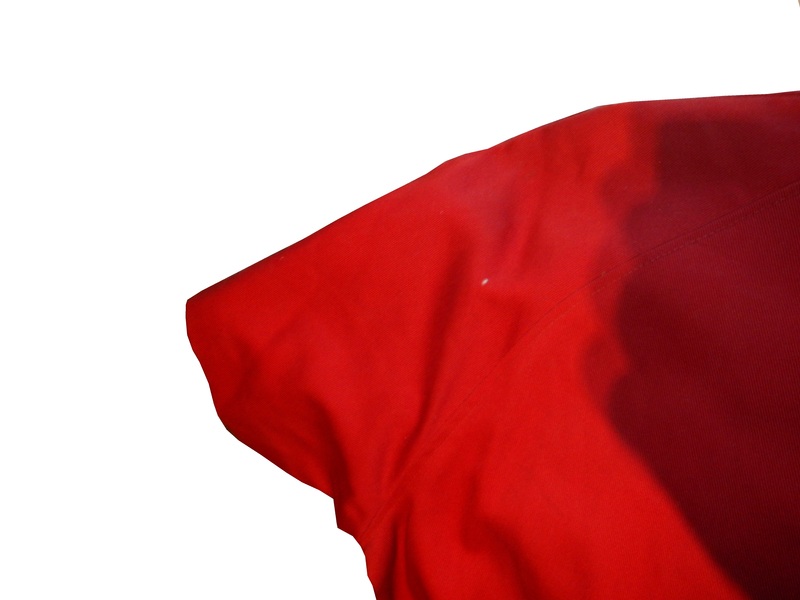 The shoulders have no epaulets, no logos on the top of the sleeves and STAND 21 logos on the ends, just below an arm restraint on each sleeve. 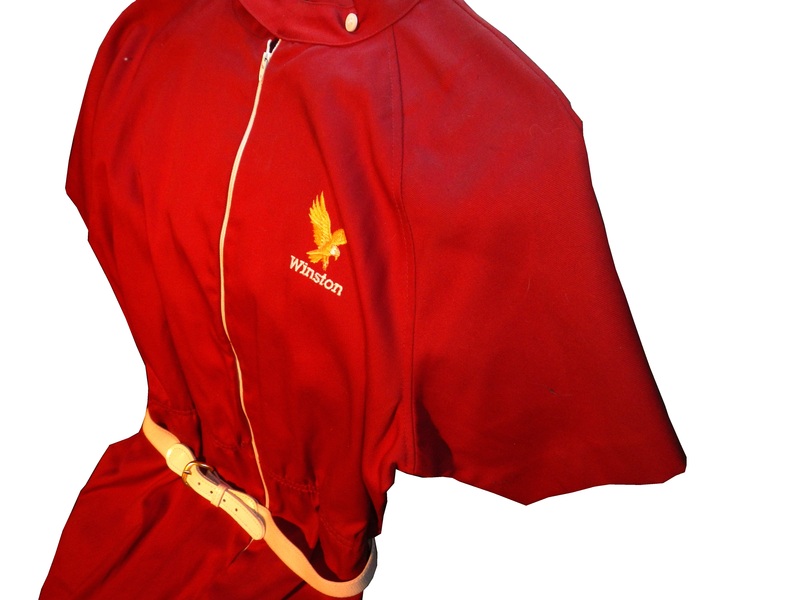 The second item is a jump suit worn by Miss Winston in the late 1970’s or early 1980’s. Miss Winston was an idea thought up in the 1970’s. The idea was to have a beauty queen with the drivers in Victory Lane after races. 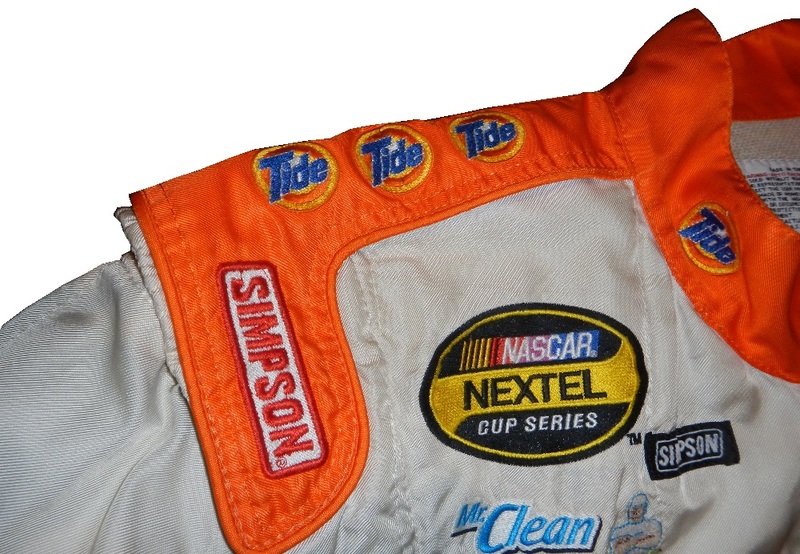 The idea died after the Winston Cup turned to the Nextel Cup, but when Sprint took over in 2009, the idea was revived. 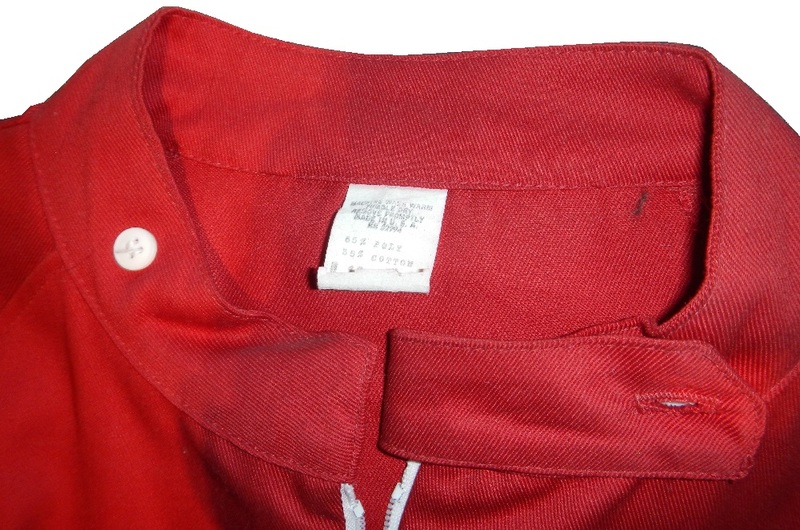 It is a simple red polyester jumpsuit with a Winston logo on the chest, a white belt, straps on the legs, and short short sleeves. 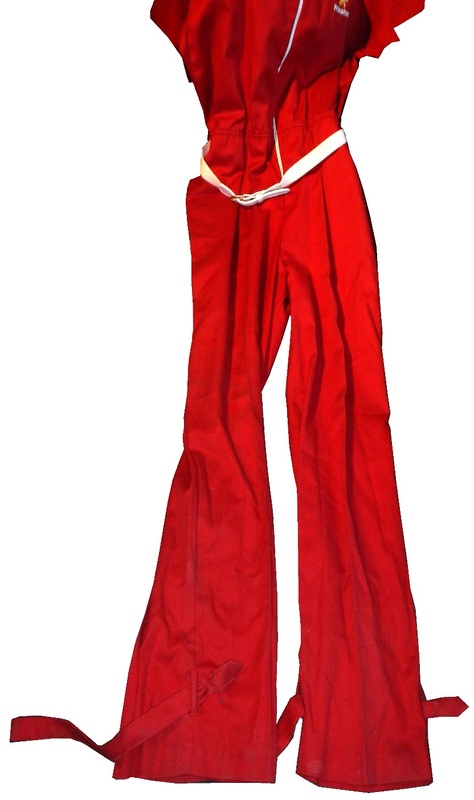 Miss Winston was an idea thought up in the 1970’s. The idea was to have a beauty queen with the drivers in Victory Lane after races. 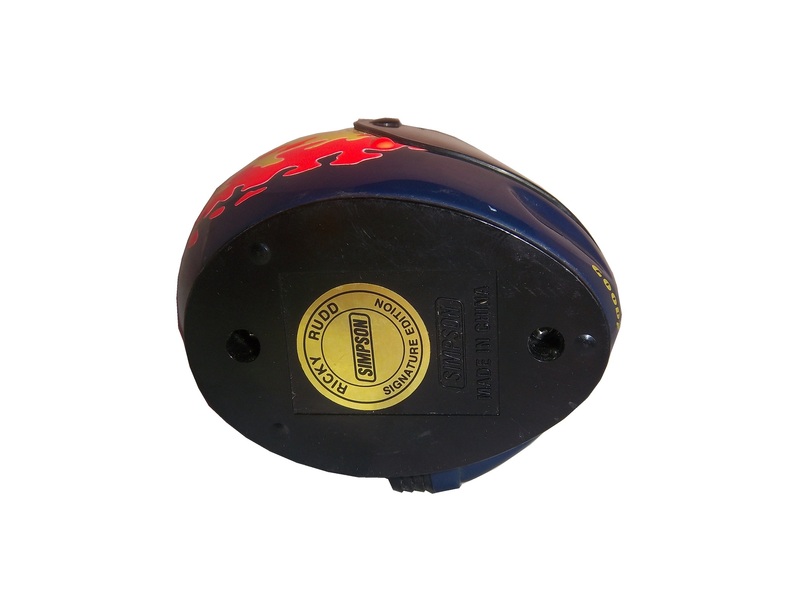 The idea died after the Winston Cup turned to the Nextel Cup, but when Sprint took over in 2009, the idea was revived. Greg Biffle #16 3M/W.B. Mason Ford Fusion Another terrible Greg Biffle scheme, another D grade. Kurt Busch #41 Haas CNC 500th Start Chevy SS Kurt is starting his 500th race this week at Dover, and to celebrate, he is running a special paint scheme. The color scheme is decent, it has a gray scale look, but it is somewhat overdesigned. I wish Kurt would have a scheme for his 500th start that is better than a C, but that is how the cookie crumbles. I Love The Tide Ride! 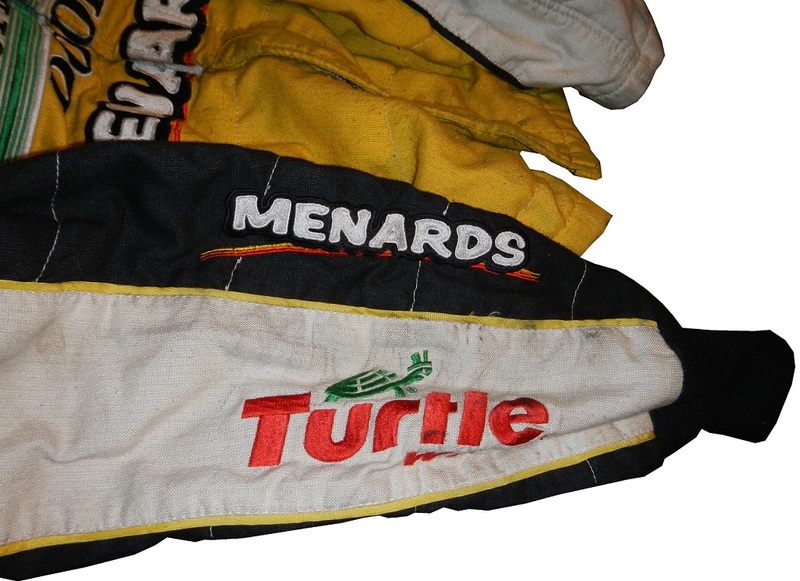 When I did The Paint Schemies last year, I also did a Top 10 list of Sponsors I Miss In NASCAR. 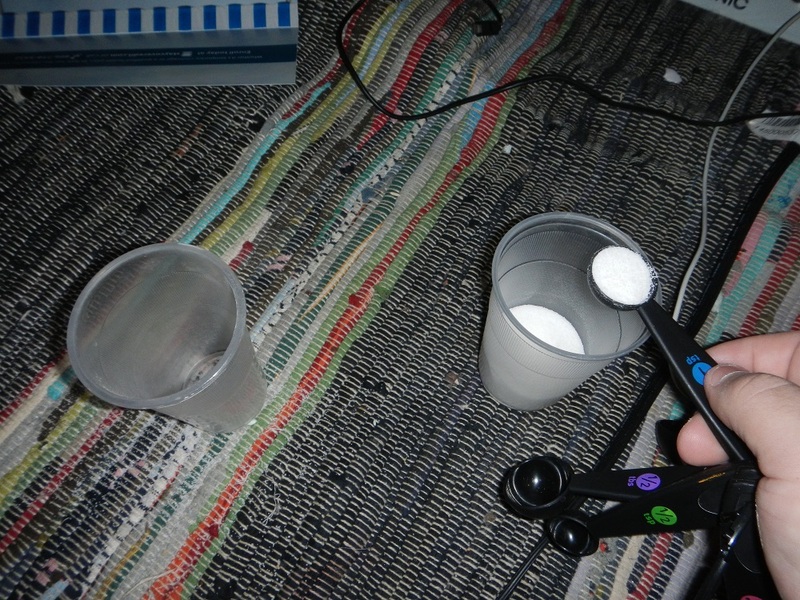 Number 7 was Tide detergent. 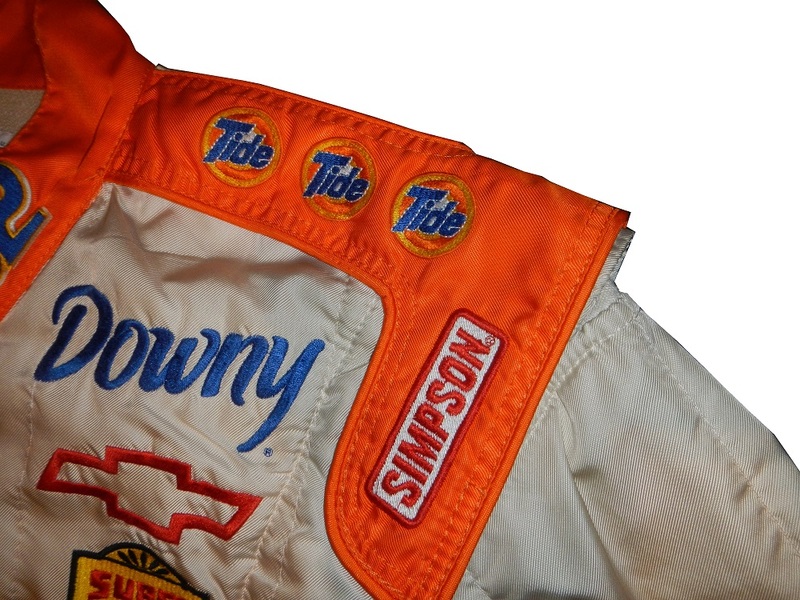 Tide was a major sponsor of NASCAR from the 1980’s to the mid 2000’s. That orange, yellow, white and blue car was distinctive without going too far. The scheme never evolved because it didn’t have to. It was one of the best schemes ever. 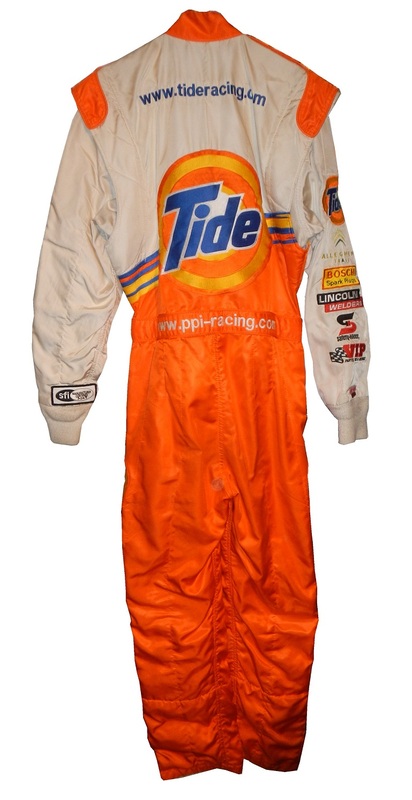 Like The Family Channel and Kodiak, I sometimes buy racing stuff because it is from the Tide Ride. 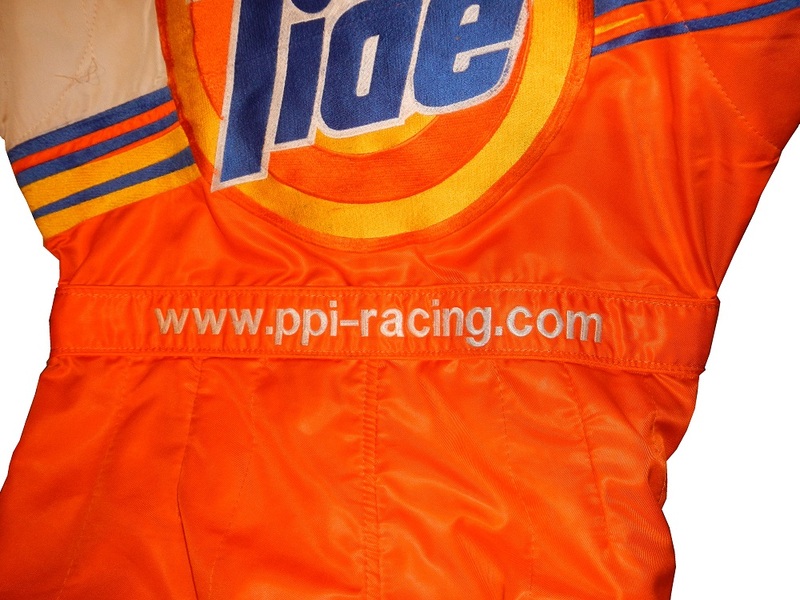 Started in 1987, the “Tide Ride” was a staple in the Sprint Cup Series, and was used heavily until 2006, when the sponsorship left PPI Racing, and wasn’t seen in NASCAR since. 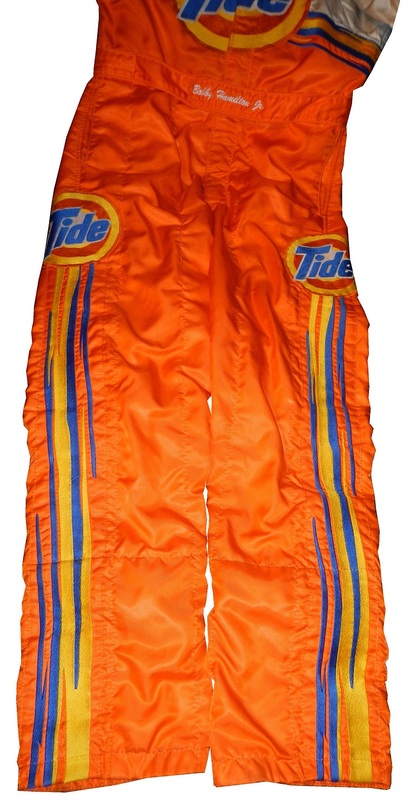 Some of the most memorable Tide Ride moments were the 1989 Daytona 500 where Darrell Waltrip did the Icky Shuffle in victory lane, the 1997 Brickyard 400 won by Ricky Rudd, and the 2003 Carolina Dodge Dealers 400 which is tied as the closest race in NASCAR history, won by Ricky Craven over Kurt Busch. 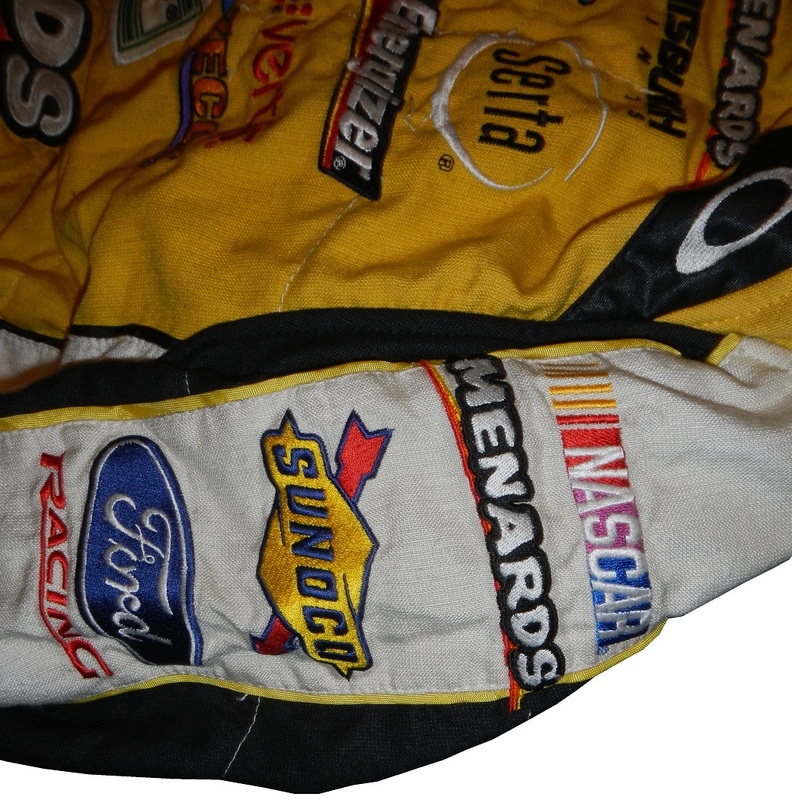 One of my favorite items is a Bobby Hamilton driver suit circa 2004-2005. This design can be seen in photos from 2004 and 2005, so I’m not exactly sure when it was used. 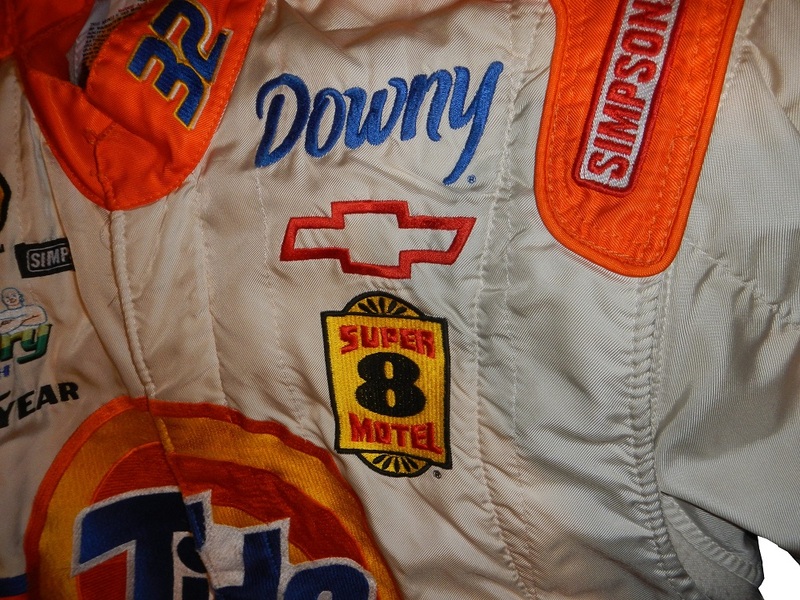 Unlike most suits I have seen, it has the car number on the collar. 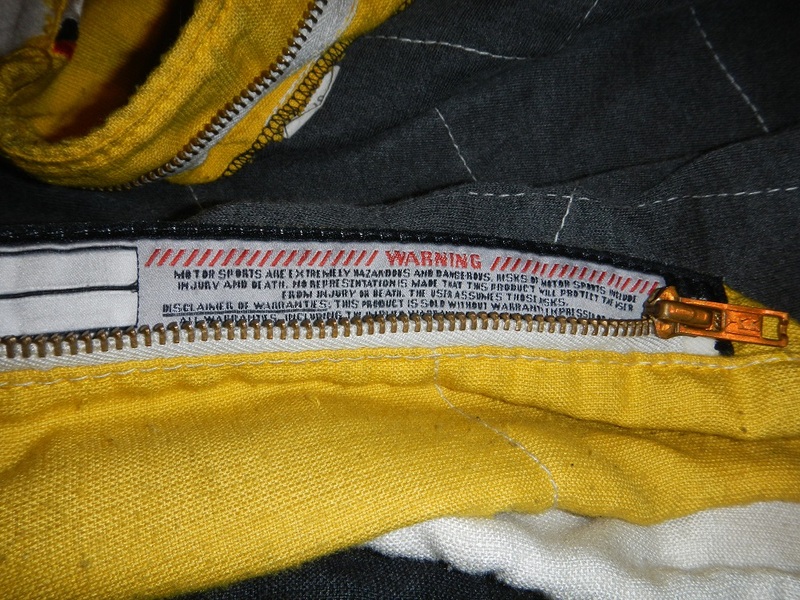 It has a white top, and on the torso logo, there is a yellow and blue stripe in a diagonal arrangement. 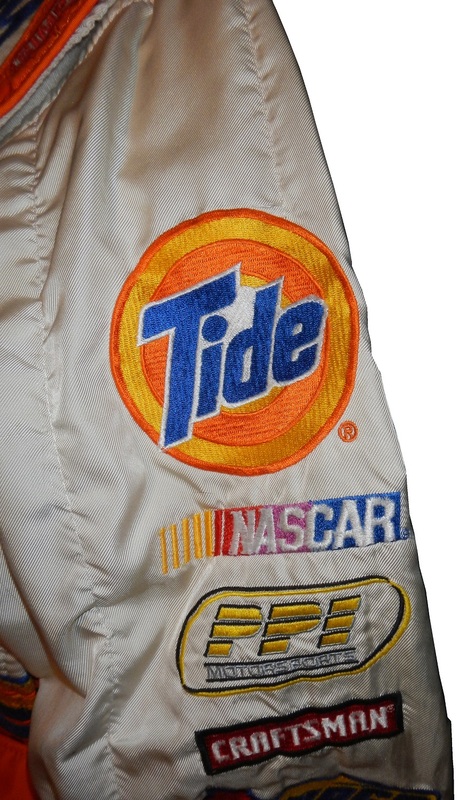 On the back of the suit, the Tide logo is on the same place in the front, with the same stripe pattern as the front. 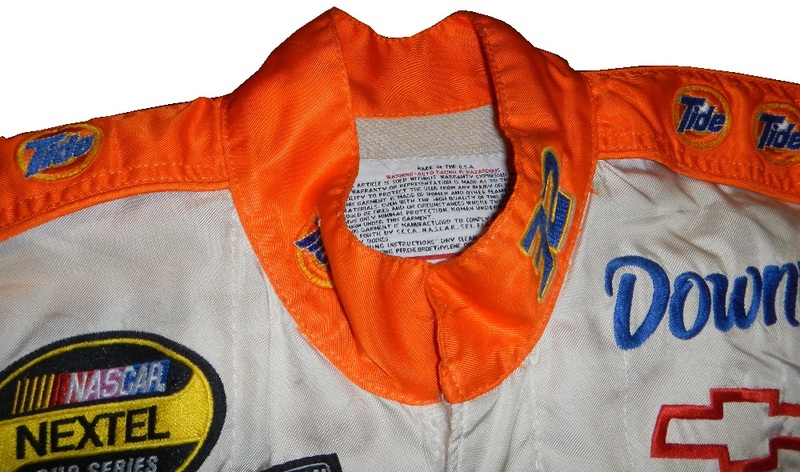 The belt has Bobby Hamilton Jr. on the front and http://www.ppi-racing.com on the back. 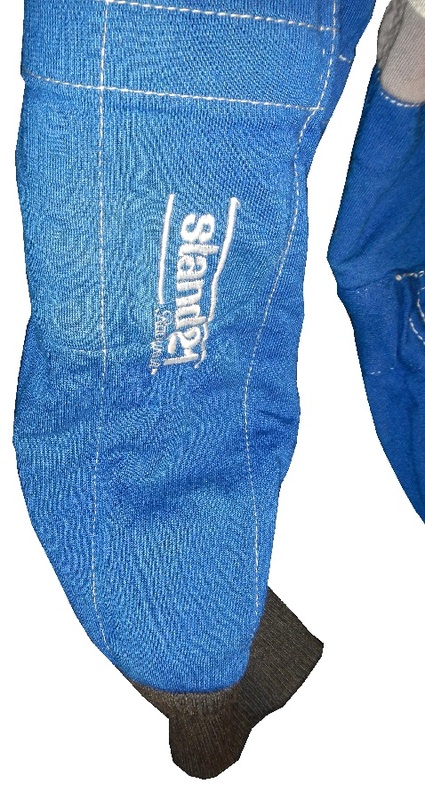 The suit has no TV logos on the sleeves or legs. The last Tide Ride item I have is this 1:87 replica hauler. 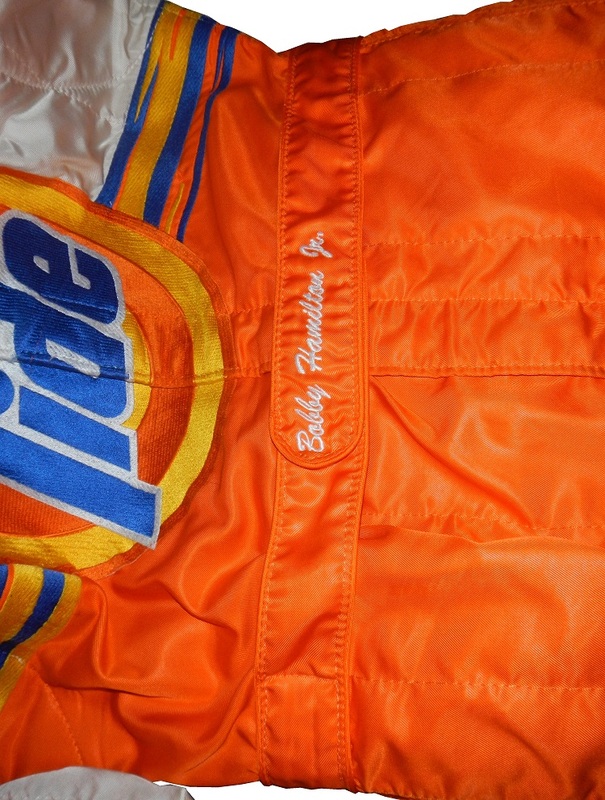 This was a perfect replica of what Ricky used during his time with Hendrick and was sponsored by Tide. Before we start, I have something I need to address, earlier this week, I discussed why I did not like the new paint scheme elements for the Chase drivers. I thought a long time about how I would approach this in the paint scheme grades, and decided that since the drivers were forced into this situation, that I would not hold it against them in the grading rules. So the Chase schemes, unless they are new schemes will not be affected since this was not of their choosing. Carl Edwards #19 Stanley/DeWalt Toyota Camry The color scheme is good, the side design could be a little more toned down, and again, I’m taking this with a grain of salt, since there can be design changes before the season starts, but this is a solid B+ design. Matt Keseth #20 DeWalt/Stanley Toyota Camry…The Killer Bees have returned! Good solid design with a great color scheme earns an A+, and like Carl Edwards above, I’m taking it with a grain of salt. Michael Annett #7 Cypress HQ Chevy SS No. Redeeming. Design. Elements. Whatsoever. F.
Michael Annett #7 Golden Coral/Feed the Children Chevy SS See Above. 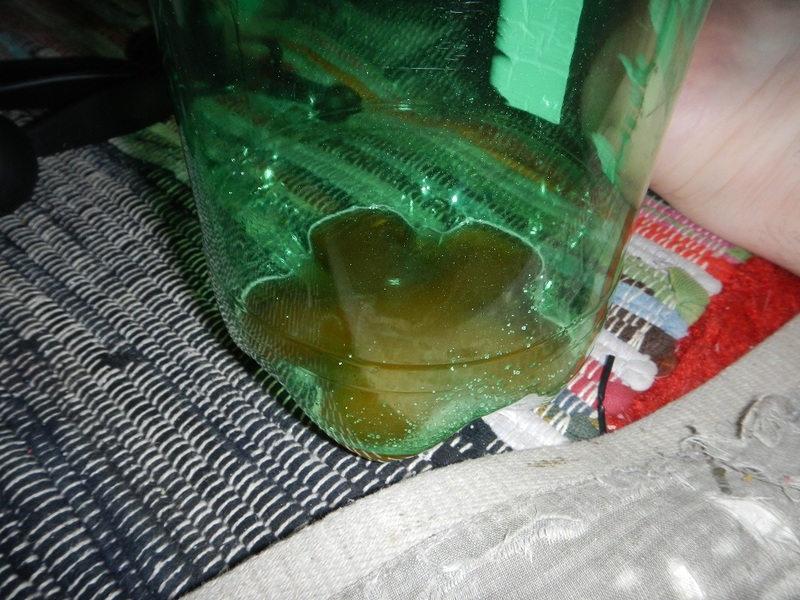 F.
After two weeks of brewing, and two weeks of carbonation, I finally got to enjoy the fruits of my labor. 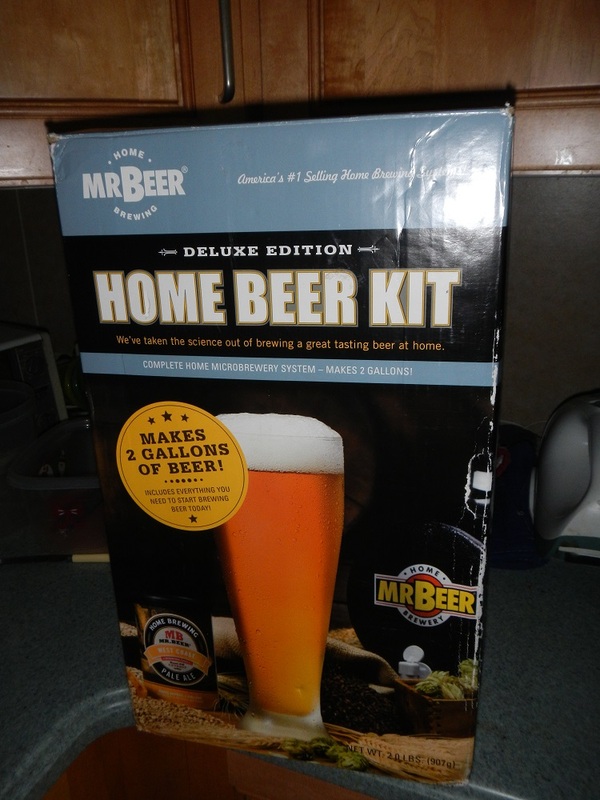 After work last night, I cracked one of these babies open, and I have to say that it was really good! I will definitive do this again! What Happened at the Carolina Nationals Yesterday? Yesterday, I called out NASCAR, today, I’m calling out the NHRA. I’m demanding an explanation for what happened during the Carolina Nationals on Sunday! Here is how I watch racing, I’ll watch a live telecast whenever possible, but I’ll watch the NHRA whenever it’s on ESPN or ESPN2 since I don’t get ESPN3. So after watching NASCAR on Sunday, I sat down to watch the Carolina Nationals Final Eliminations. The first round of top fuel and funny car went well, at least from my perspective. Then, pro stock started their first round, and the Allen Johnson/V Gaines race started, and I’ll let the video speak for itself. The 67 year old Vieri Gaines was unhurt, but what happened next stunned me. What followed was an hour of discussion between the crews and the NHRA officials concerning track conditions. The wreck itself did damage to the track, but there were problems leading up to that race. 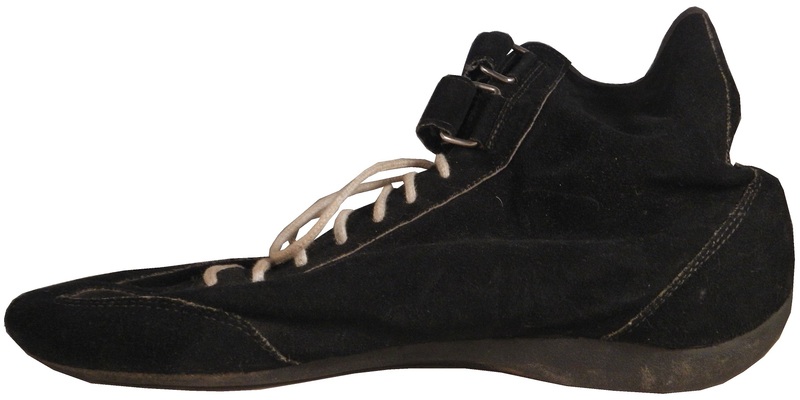 The track had been dealing with concrete issues on the racing surface. Allen Johnson was interviewed while the wreck was being cleaned up, and he slammed the NHRA for letting the cars race on the surface. John Force was very upset, and Tony Schumacher called the racing surface “un-race-able.” Obviously the NHRA officials were aware of the fears of the drivers and of the conditions of the track. There were attempts made to solve the issues, but rain and a bad surface caused the cancellation. I want an explanation, from Z-Max Dragway, the NHRA or someone involved as to how a racing surface can get that bad. Obviously there was a failure somewhere, and something like that happened. How could the NHRA and Z-Max Dragway allow the competitors to race on a surface that was obviously not capable of holding races safely! I normally wait until Saturday to post new blogs, but this needs to be discussed right now! I’m demanding an explanation, and the NHRA and Z-Max Dragway owe not just me, but all of their drivers, crew members, sponsors and fans an explanation. Many fans left disappointed, fans watching from home were too, and there was no reason for this. Why wasn’t the racing surface safe? Why was concrete lifting off the track? Why in the world was the track sub par? What makes it even worse is that someone high up on the NHRA chain of command made a decision to allow the race to go ahead despite an unsafe racing surface, and I want to know why they would risk driver safety in that respect! Both groups have a duty to ensure the safety of the competitors and fans, both groups failed horribly in that respect. V Gaines got lucky, and wasn’t seriously hurt, but that could have been a lot different. How could something like this take place in this day in age? Tom Compton, Dallas Gardner, Bruton Smith, you owe everyone involved, drivers, crew members, sponsors and fans an explanation for yesterday’s debacle. What happened was unacceptable, and someone needs to stand up and explain what decisions were made prior to the event, what the officials knew, and why the decisions were made the way they were. 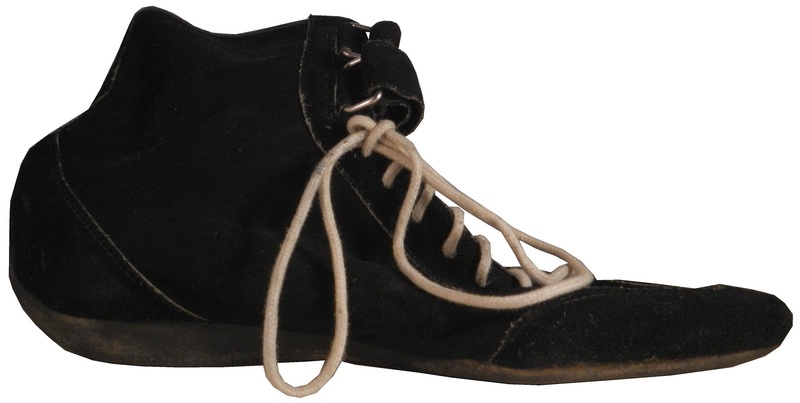 A collection of baseball, basketball, football, hockey, auto racing, and other autographed items. 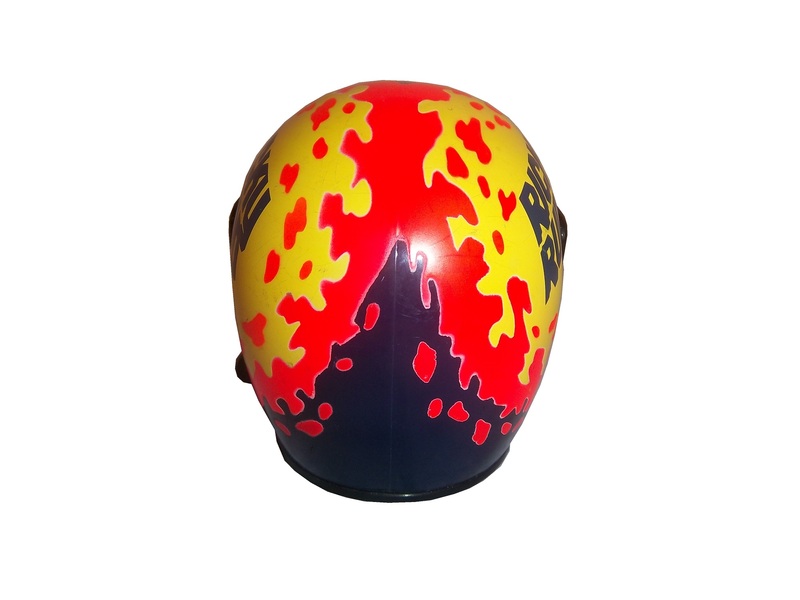 The Chase Design Elemets…Too Much of a Good Thing! Well the Chase for the NASCAR Sprint Cup has begun. What that means for the 16 drivers in the Chase is special paint scheme rules. Specifically, all Chase drivers will have yellow numbers on the roof, a yellow windshield banner, a yellow front splitter, and special decals. I waited on discussing this issue because I wanted to see how the cars looked on track. While some cars looked good, with the yellow elements working well, other cars looked awful, with the yellow clashing with the current design scheme. No car suffered as much as Brad Keselowski and the Miller Lite Ford. I can live with the yellow roof numbers, it has been done before, the and I can live with the windshield banners and decals, I’ll comment on that later, the splitter design is pointless and it makes the car look ugly. Why in the world did NASCAR make the splitter yellow? It serves no purpose, and clashes with the rest of the paint scheme. Now I wanted to comment on something I noticed that NASCAR is doing. I was worried about this and these fears are now coming true. When the windshield banner was introduced with the Gen 6 cars in 2013, I did not like it. I thought it was pointless, and it didn’t add to the car at all. What I was worried about, but I didn’t discuss it was what else NASCAR had planned for the banner. Well we found out this year. 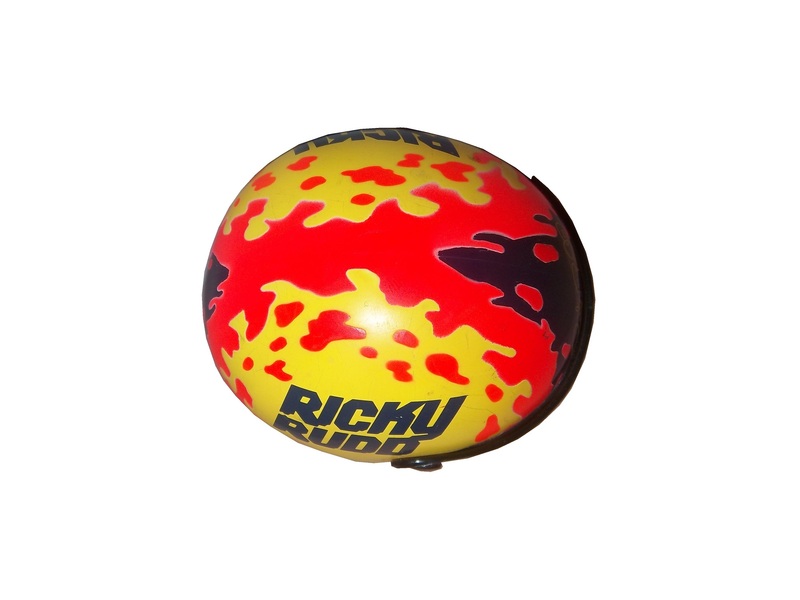 In addition to the plain black, there have been green designs for environmental awareness, patriotic designs for memorial day and the 4th of July, and of course the yellow Chase designs. NASCAR is using this as their vehicle for promoting causes. Like pink bats on Mother’s Day, or patriotic jerseys for Memorial Day in baseball. October is around the corner, and the Pink-washing will begin in earnest, and I’ll be shocked if there aren’t pink banners on the windshields. I noticed something else when it comes to banners. There are two decals that cars carry, one is the Sprint Cup Series decal, and above that is a NASCAR Race Car decal. When the windshield banner is a special design, the NASCAR decal is a matching design. Let’s look at that Brad Keselowski Memorial Day scheme again. Notice the decal just above the Sprint Cup Series decal? It is a star with NASCAR written on it. Now let’s look at Brad’s car from the Brickyard 400. 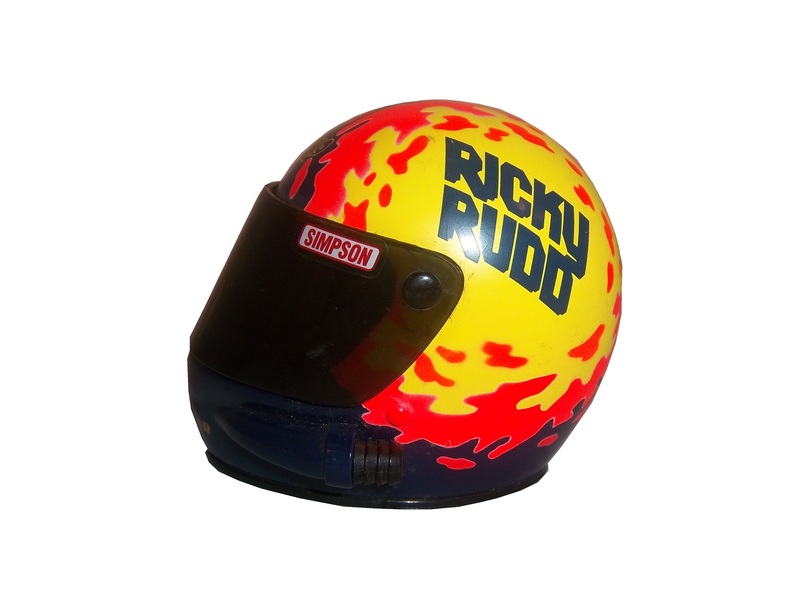 The NASCAR decal is a simpler, more plain design. This is Kevin Harvick’s car with the green banner. Notice the NASCAR decal…it matches the banner. Why is this important for the Chase schemes? Well because whoever came up with this idea felt the need to give the Chase drivers special NASCAR decals. 16 drivers get yellow decals, the rest get silver. I’m reminded of the Star-bellied Sneetches in this situation…the second time that reference has been made in regard to sports uniforms this year. I’m really wondering how much more NASCAR can over-complicate this, I really am. Why not add yellow wheels and yellow spoilers? I’m amazed that NASCAR could mess this up they way they did. Get rid of the yellow spoilers and NASCAR decals, and I wouldn’t have a problem with it, but too much salt spoils the soup…every time. I’ve been getting off track(pun intended) lately, and I’m gonna get back to basics. I’ve been wanting to do an article on a set like this for a while. 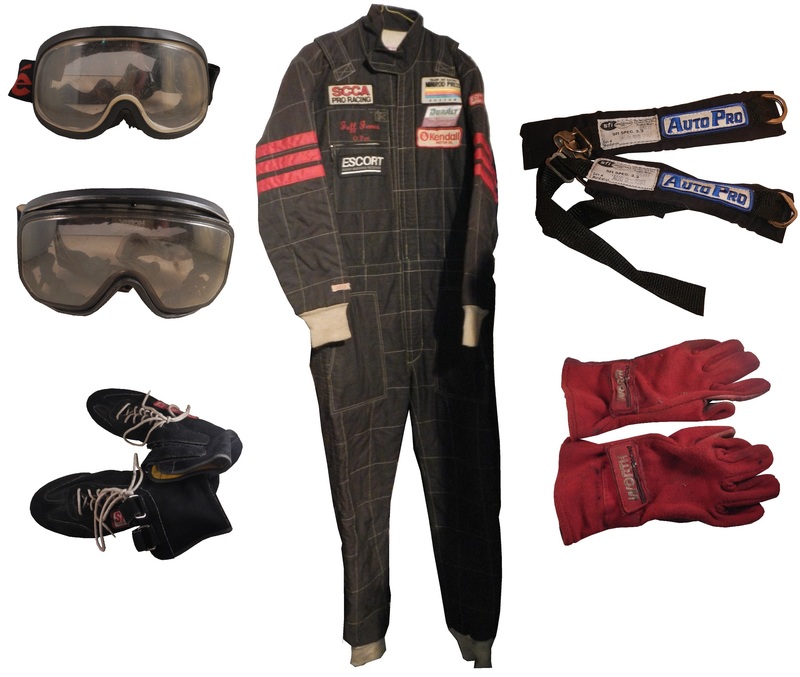 I bought a set of items used by one driver at the same time, namely a driver suit, driving gloves, shoes, goggles, and arm restraints worn at the same time by a driver by the name of Jim Jones, an SCCA racer in the late 1970’s through the late 1980s. 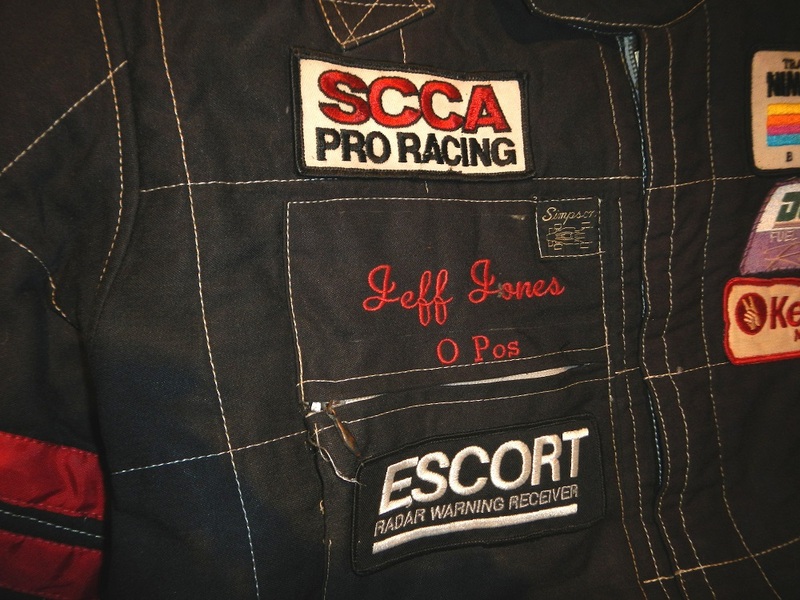 He was a weekend warrior who raced for the love of racing. 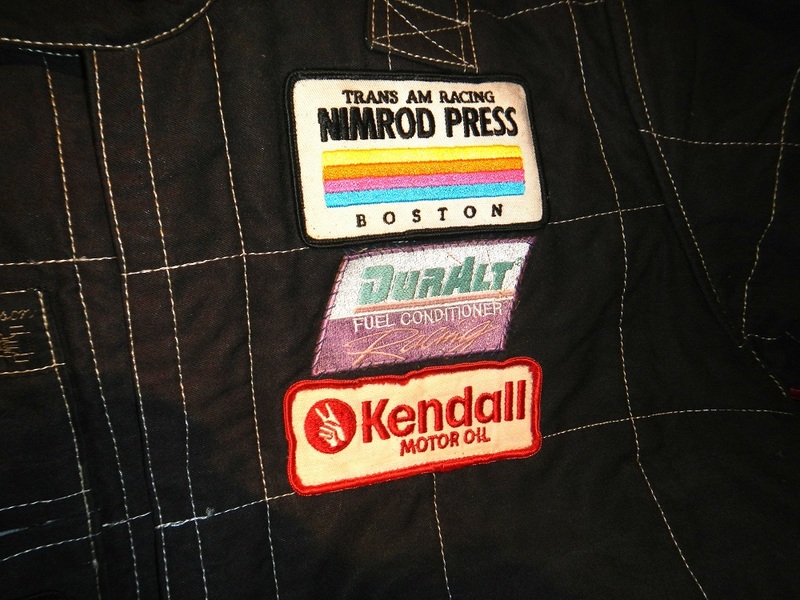 In the late 1980’s he raced a Pontiac Trans Am and was sponsored by Boston-based Nimrod Press. 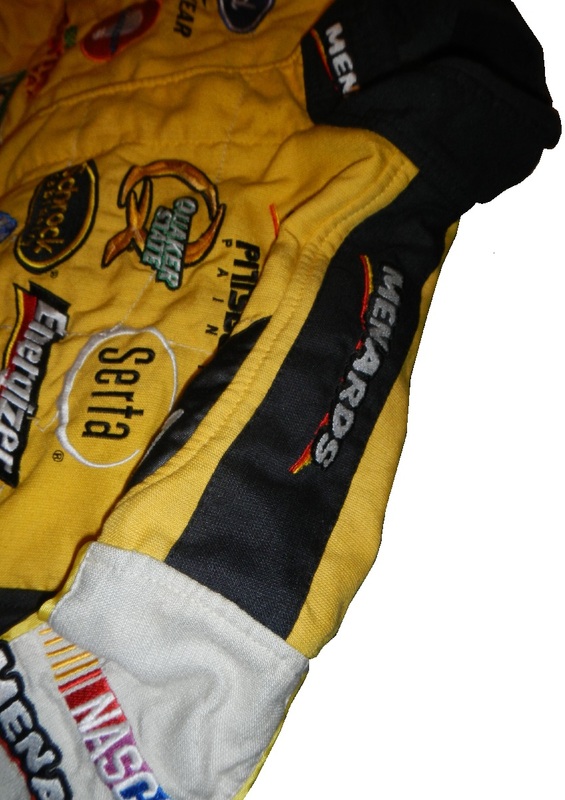 The first and most prominent item is this driver suit. 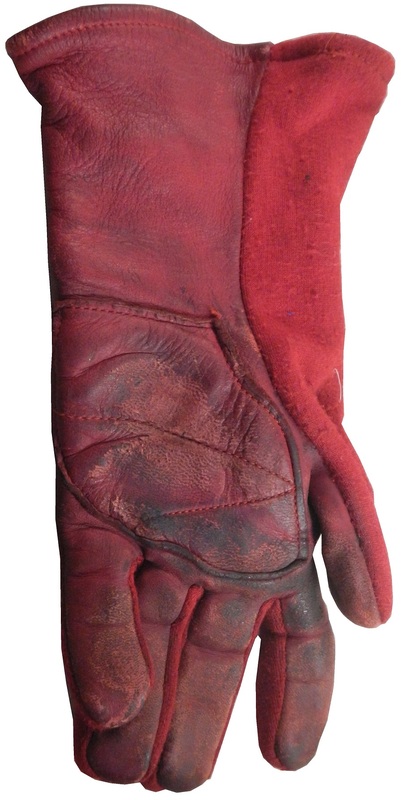 It was worn by Jones in the 1980’s, and is black with red safety stripes and a quilt pattern. 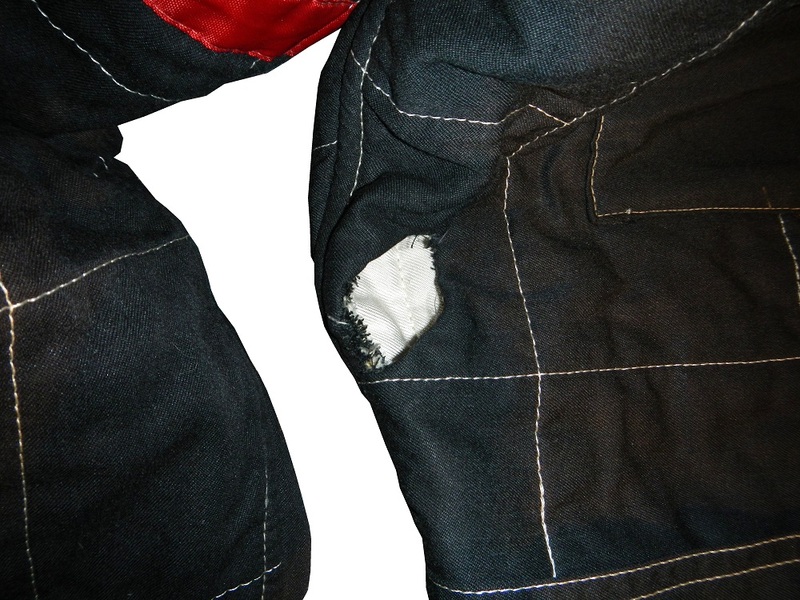 The suit shows a nice amount of wear. 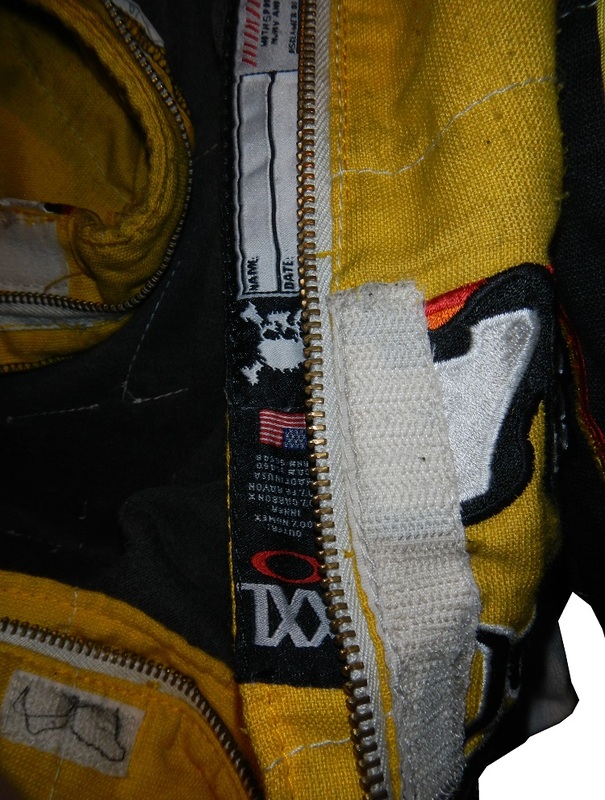 There are a number of small sponsor patches on the chest and it has a blood type indication sewn into the suit under the number. This is so that in the event of a very severe accident, the hospital can know quickly what blood type Jones is and get him a transfusion. 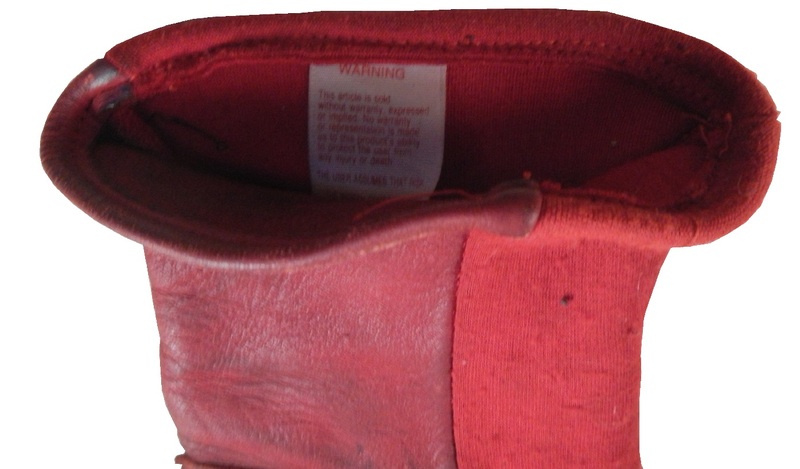 You also often see this on motorcycle helmets. 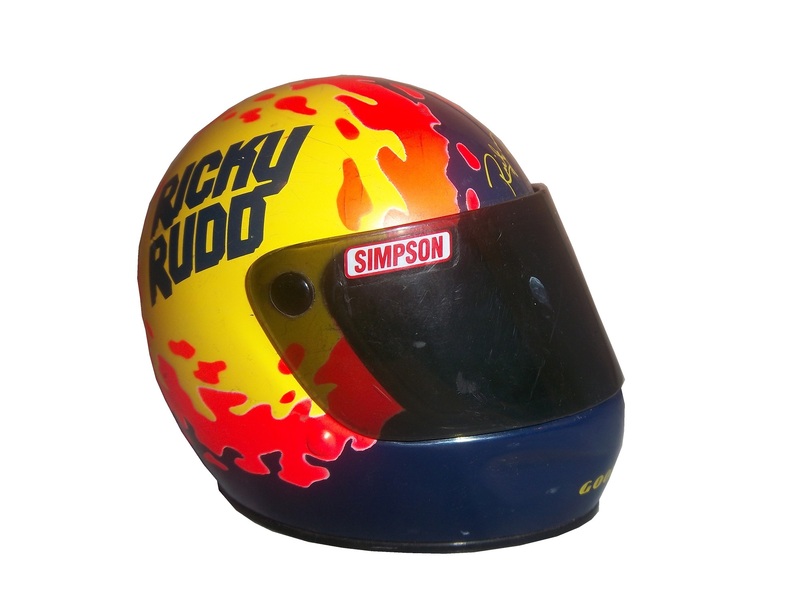 The shoulders have safety straps, the sleeves have safety stripes in red, and the old school SIMPSON RACE PRODUCTS patch on the sleeve. 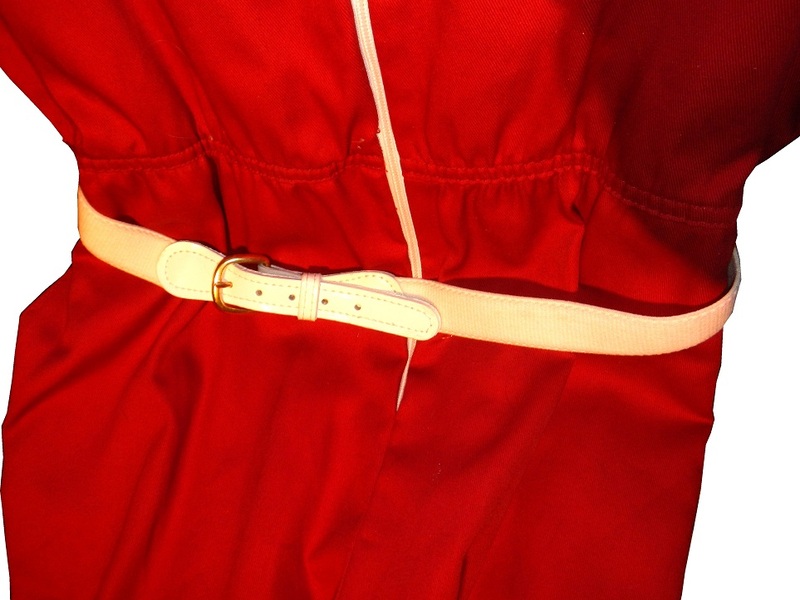 The belt, legs, and back have no decoration to speak of. There is a small tear just above the belt. 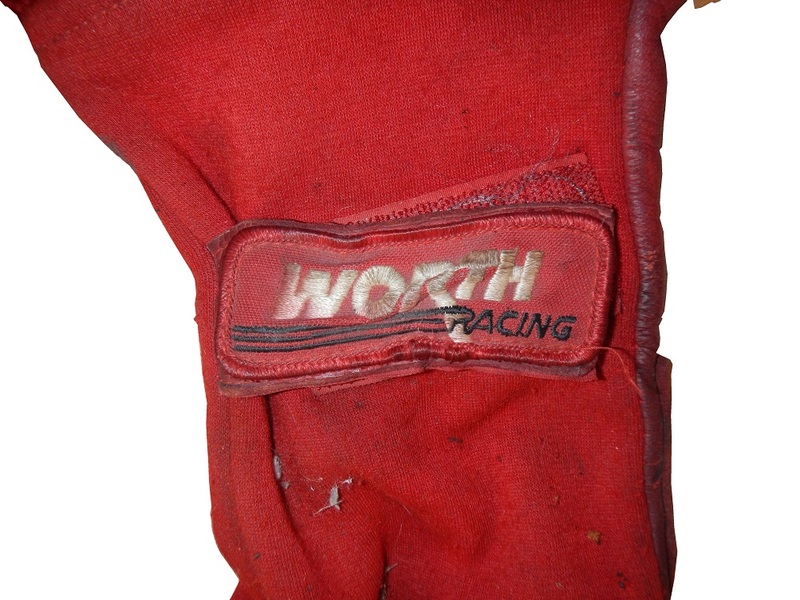 The second item is a pair of Worth racing gloves. 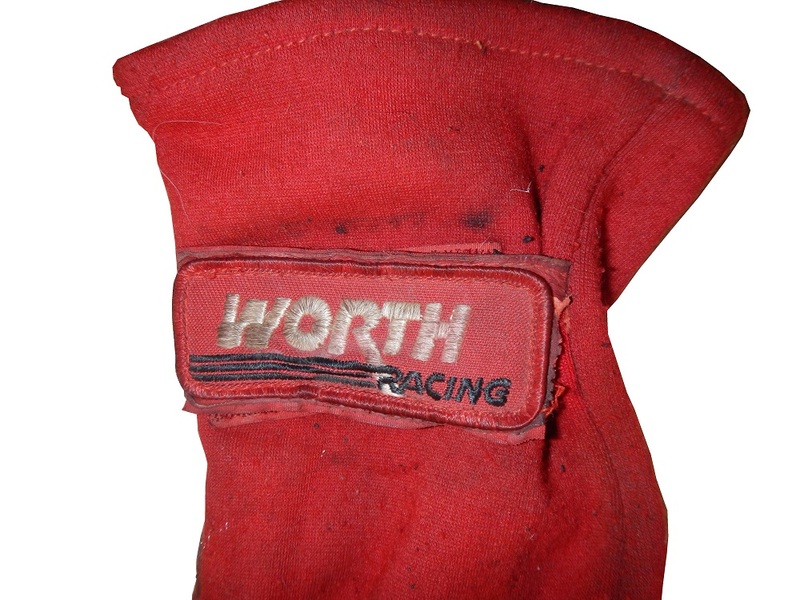 The gloves show a large amount of wear, with the Worth racing logo damaged on both gloves, and the padding on the gloves is highly soiled. 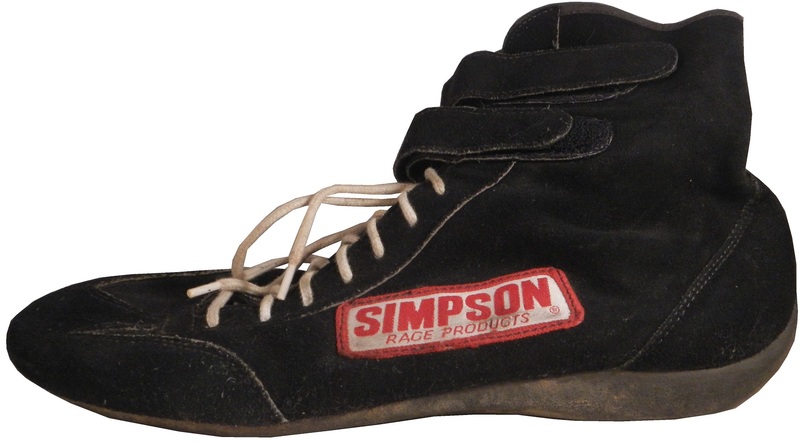 The third item is a pair of Simpson racing shoes, which show a decent amount of wear. I love the fact that the inside of the shoes is neon yellow, whereas the outside of the shoes are all black. 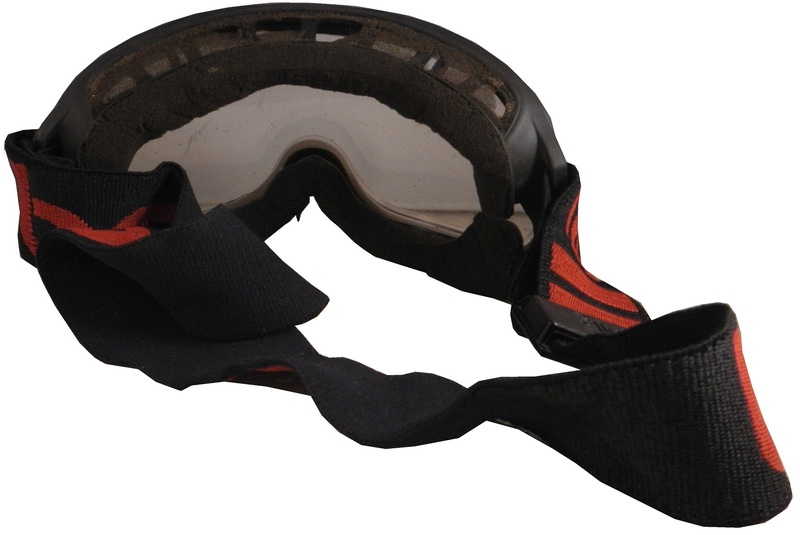 The third and fourth items are pairs of goggles. 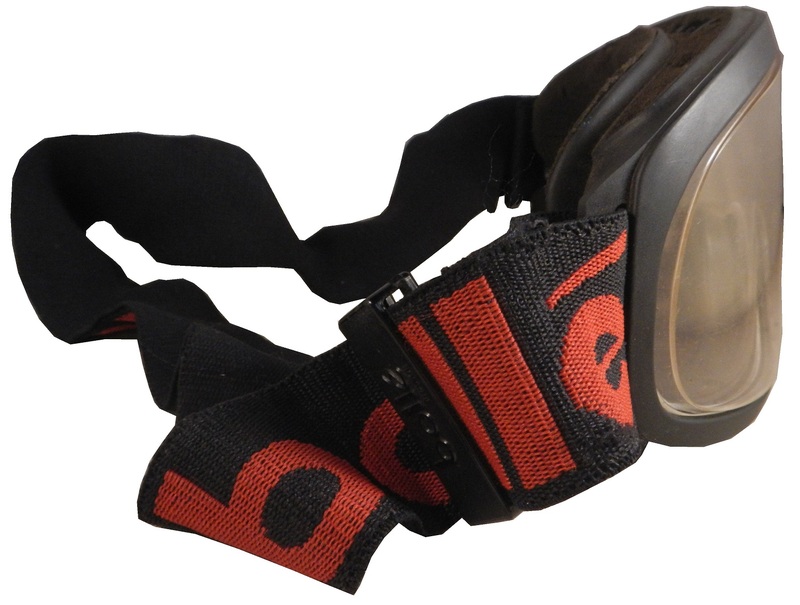 The first is a French pair of Bolle goggles, which show a decent amount of wear. 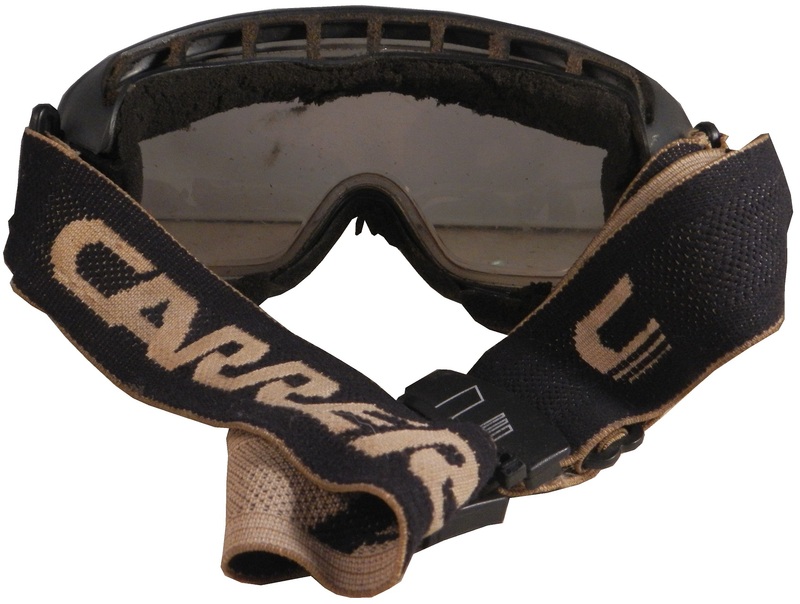 The second pair is an Italian pair of Carerra goggles, which also show a large amount of wear. 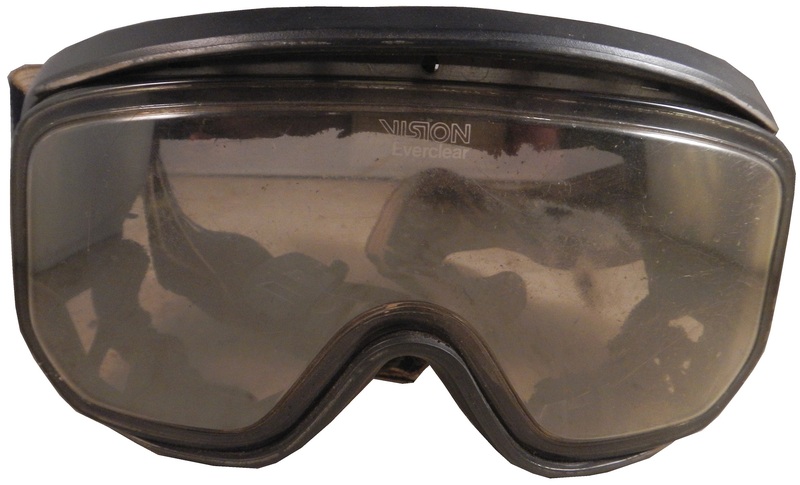 These were from a time when drivers wore helmets that mandated goggles. 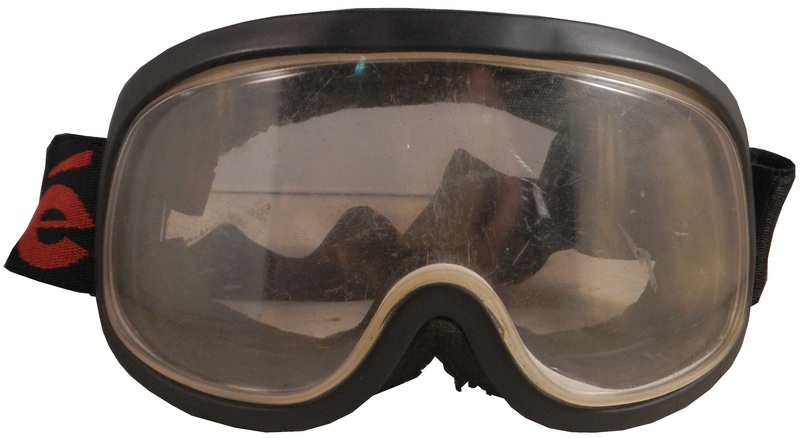 Even full-faced helmets needed goggles. 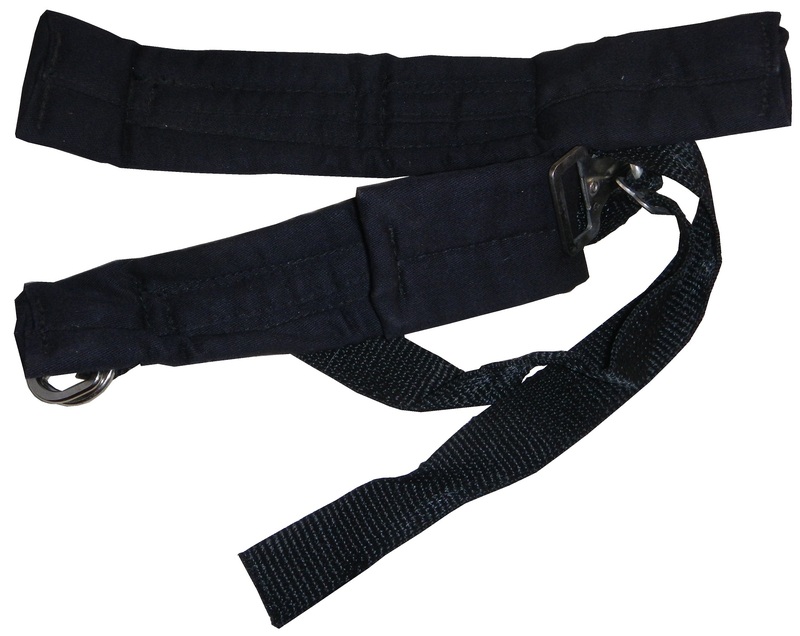 The last item is a pair of arm restraints. 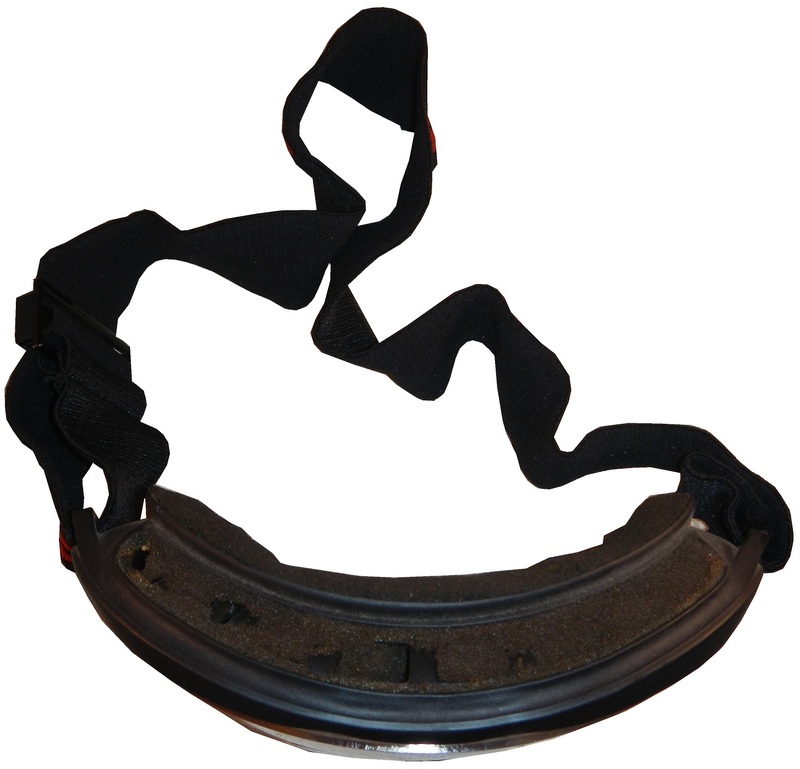 Many racing series mandate these to prevent arm injuries that occur from crashes when the drivers are in restricted driver cockpit. 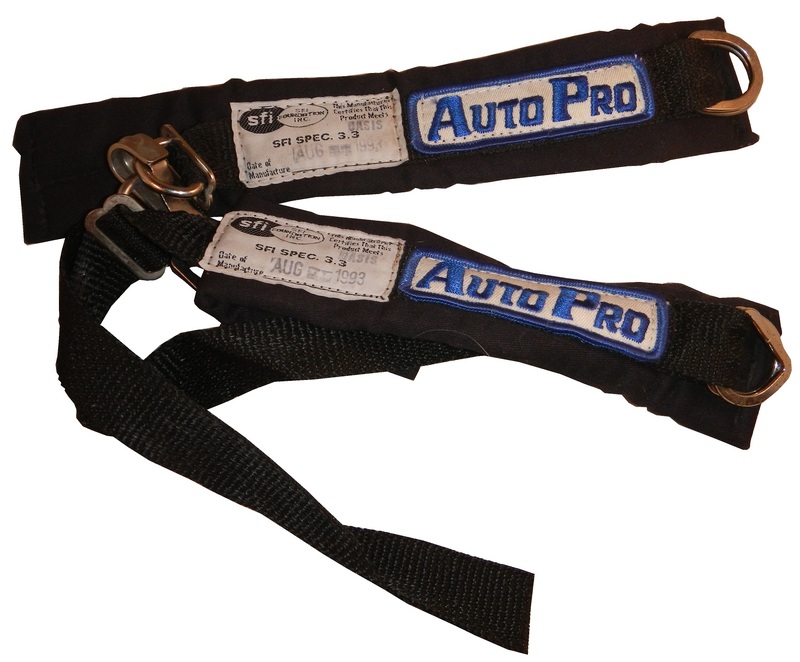 This particular pair of restraints were made by Auto Pro, and show a decent amount of use. 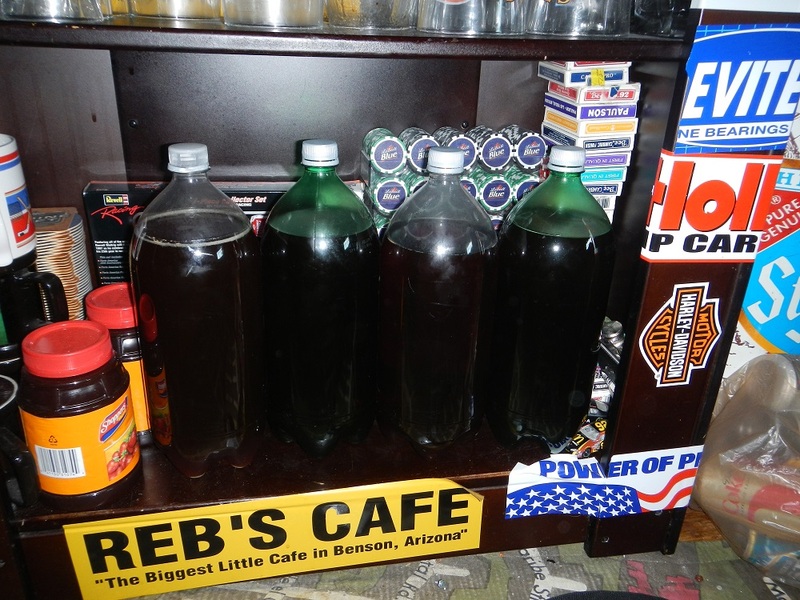 This week, I’m gonna share my recipe for Dave’s Nitro Burning Ribs. These ribs are easy to prepare and have a unique sauce. I like to use a Siracha Stout barbeque sauce for my ribs. So, without further ado, the rib recipe! 1. Mix together the cumin, garlic, granulated onion, cayenne pepper, brown sugar, paprika, chili powder, white pepper, salt, and black pepper. Rub the spice mixture over both sides of the ribs. Wrap in plastic and refrigerate overnight. 2. Preheat the oven to 325°F. Unwrap the ribs and place them on a baking sheet. Cover completely with foil. Bake for 1 hour and 10 minutes. Remove the foil and let the ribs cool. Refrigerate them, wrapped in plastic, until you are ready to pack, up to 24 hours. 3. While the ribs are cooking, it’s time to make the sauce. In a pot over medium heat, add the oil and allow to get hot but not smoking. Add the garlic and stir until you can smell it, about 30 seconds. Add the remaining ingredients and stir until combined. Allow to cook until thickened, stirring occasionally, about 15 minutes. Store in an air tight container in the fridge. Until you are ready to leave. 4. 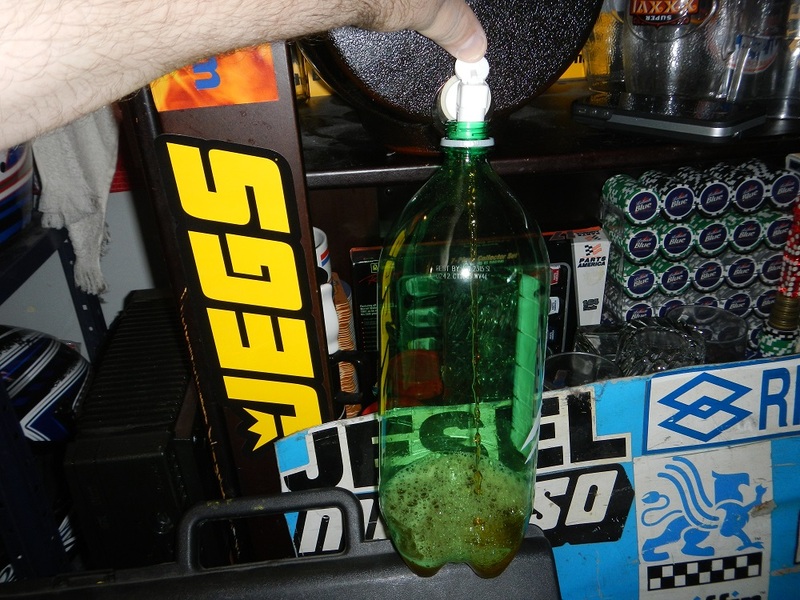 Just before leaving, Place the racks in a large, seal-able plastic container. Add 1 cup of the barbecue sauce and stir so all the ribs are coated. 5. At the track, Prepare the coals. When the coals are hot, grill the ribs for 10 minutes, until they are lightly charred and heated through, turning them several times and applying several more coatings of sauce. Serve the ribs hot, accompanied by more sauce. 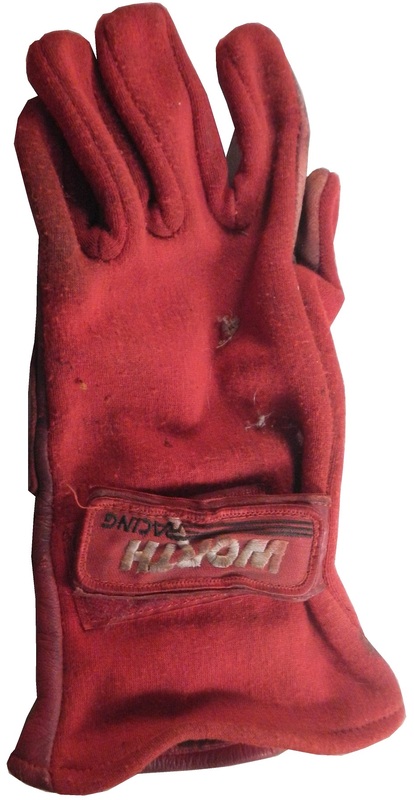 A collection of NASCAR, and NHRA race used equipment, including parts and sheet metal. 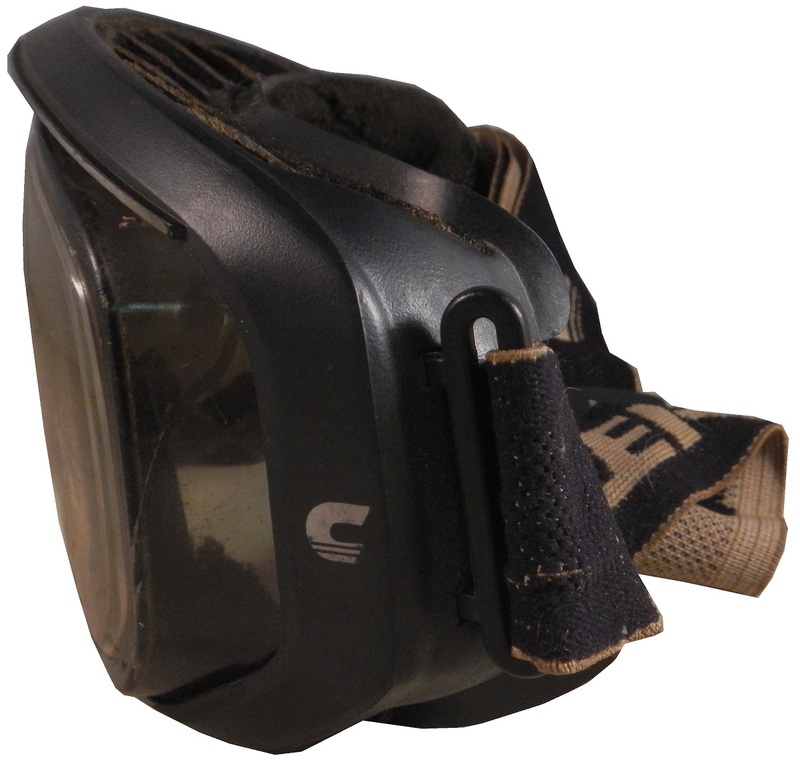 Oakley…Not Just For Sunglasses Anymore! 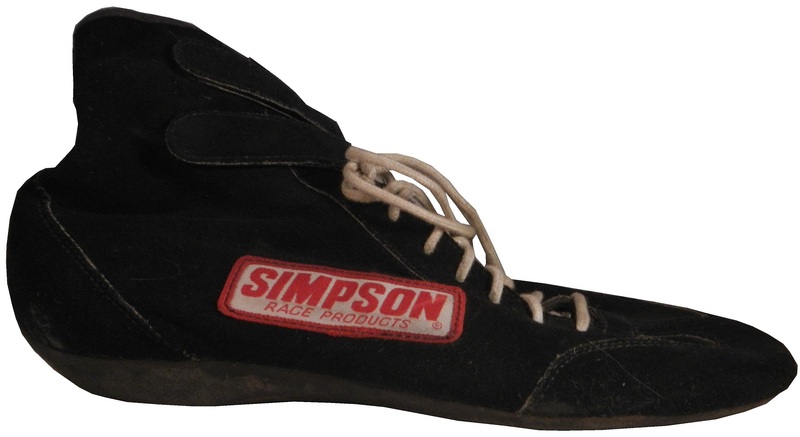 When you say “driver suit” you think of names like Simpson, Sparco, Impact!, OMP, Stand 21, and Momo, you don’t automatically think of Oakley. 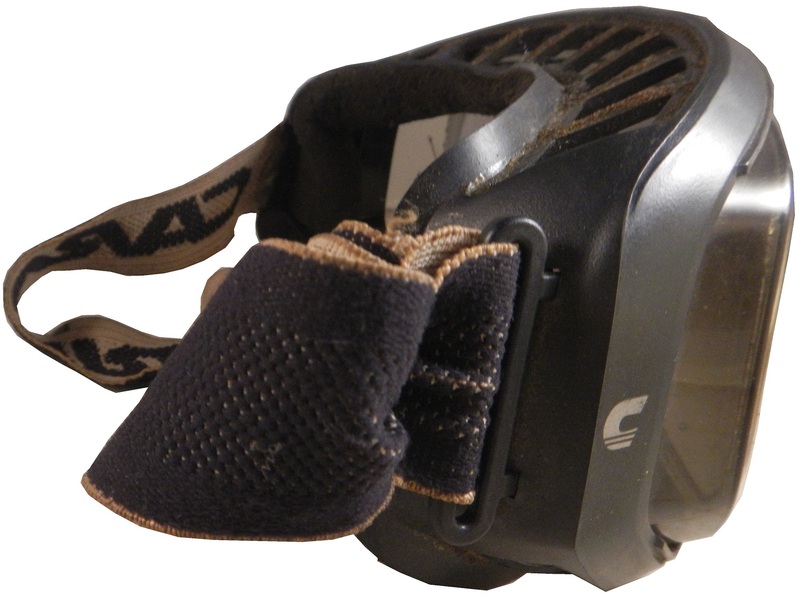 Oakley started in 1975 as a sunglasses company by Jim Jannard in his garage in Foothill Ranch California. He got the name from Oakley, his English Setter. He went from working in his garage to one of the biggest sunglasses companies in the world. 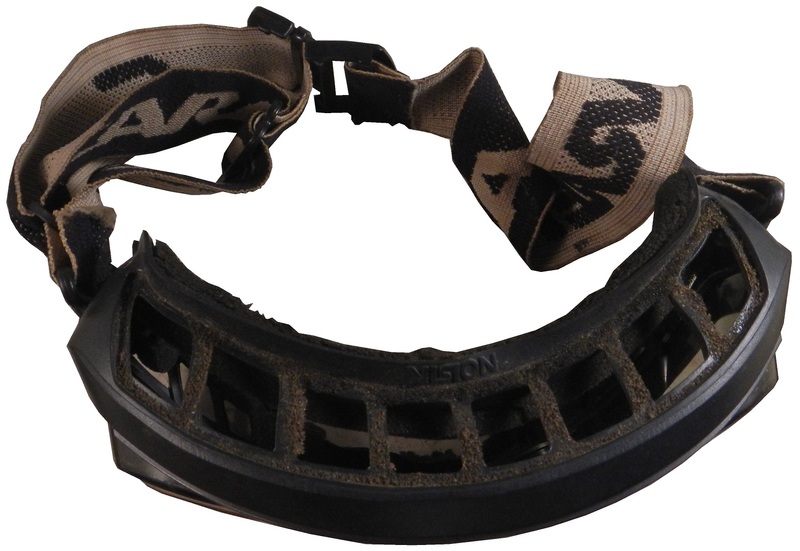 They design eyewear for athletes, the military, skiers, and, starting in the late 2000’s, motorsports apparel. 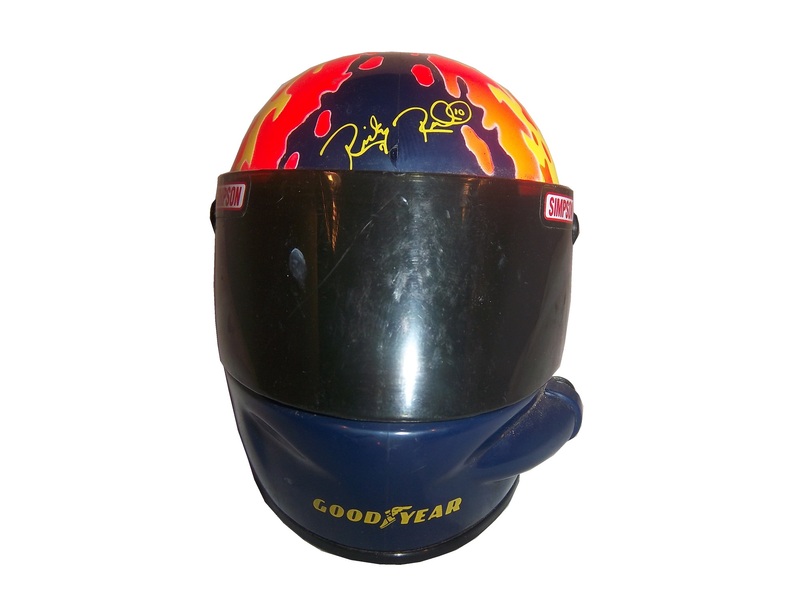 Oakley makes a number of racing items, the most prominent being driver suits. IndyCar drivers Justin Wilson, Ed Carpenter, Mike Conway, and Josef Newgarden all wear Oakley driver suits as do Alex Bowman, Ryan Truex, Martin Truex Jr., Clint Bowyer, Jeff Burton, Michael Waltrip, and Ricky Stenhouse Jr. in NASCAR and Tony Schumacher in the NHRA. 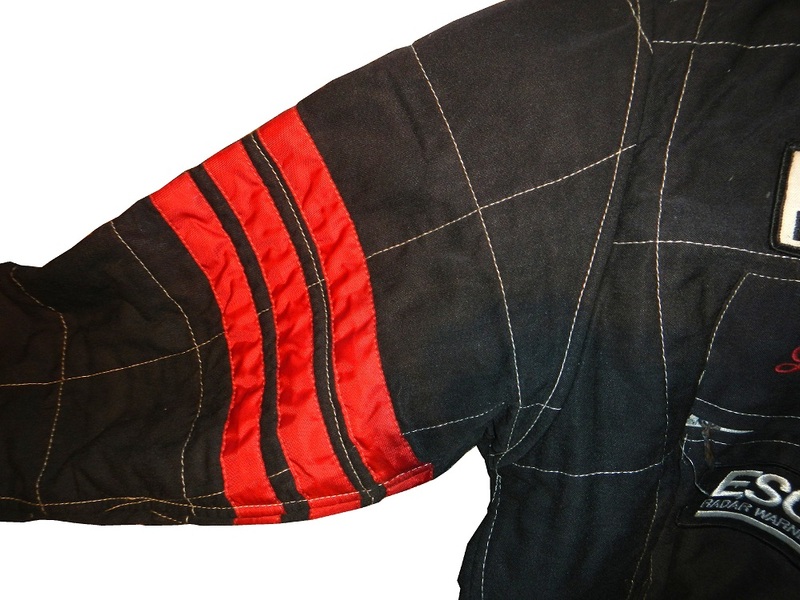 While they make suits for the top drivers in the sport, for some reason they don’t seem to sell suits through their own site, you have to go to a third-party site to buy their racing suits…which to me seems odd, because no one else ever does that. 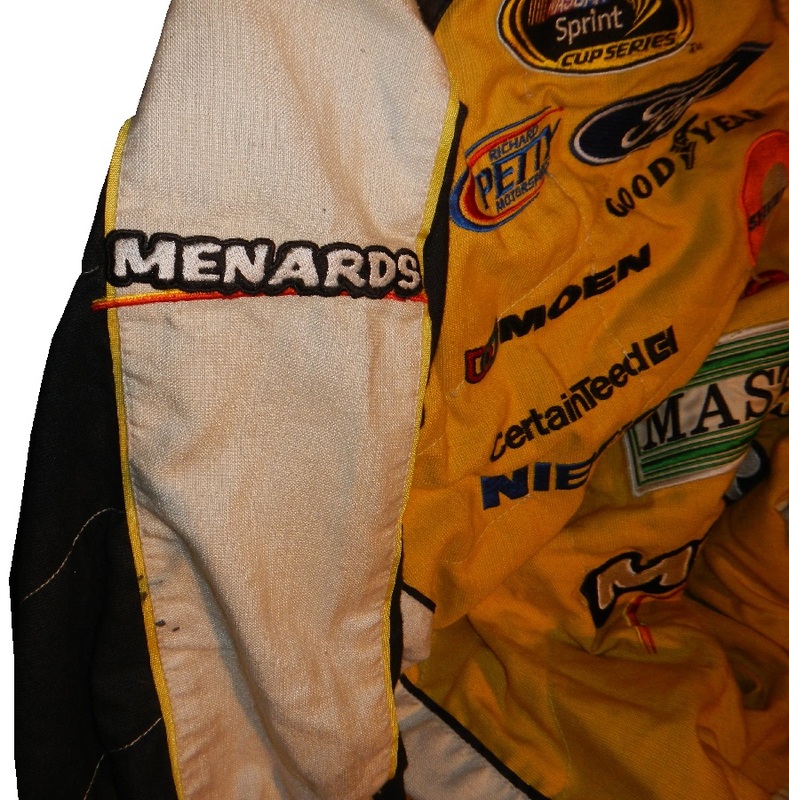 This particular suit was worn by Jason Romesburg, who was the rear tire changer for Paul Menard in 2010. 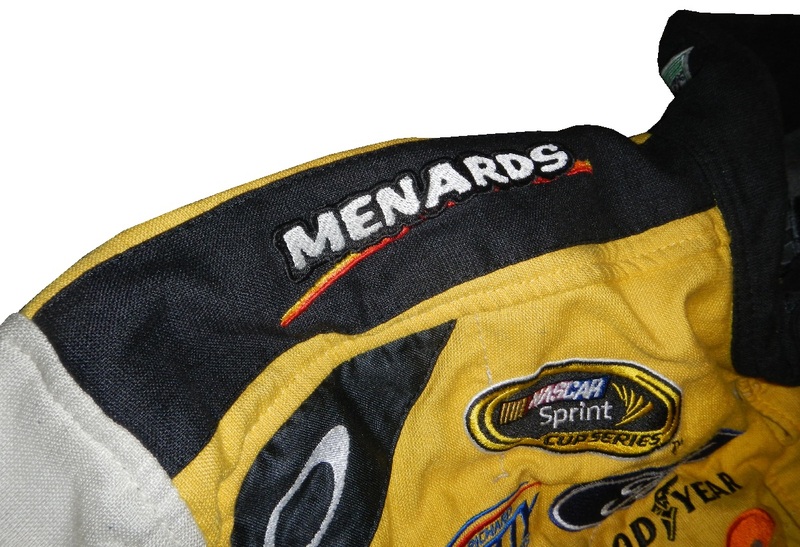 Menard had a decent season, with a top 5, and 6 top 10’s and 17 laps led. 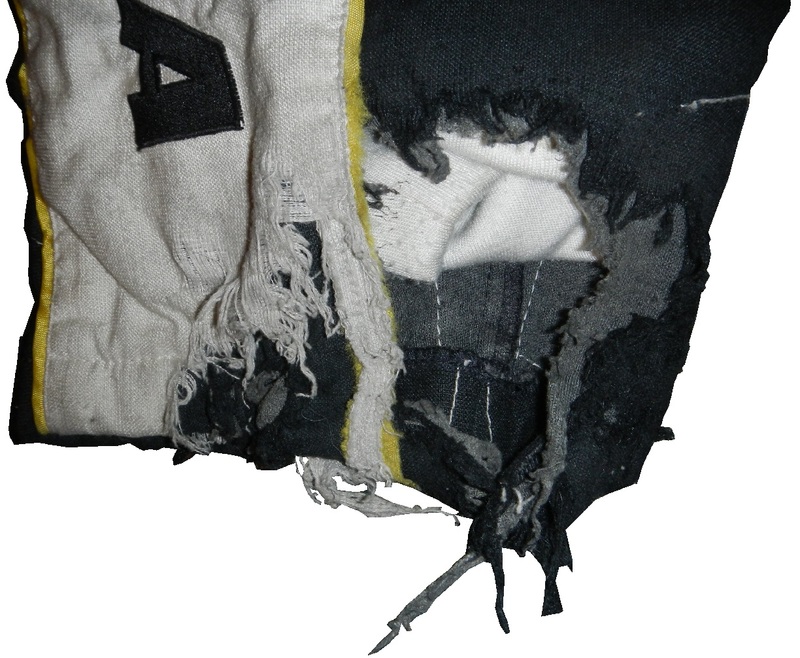 The suit shows heavy use, with the right cuff on the pant leg destroyed. 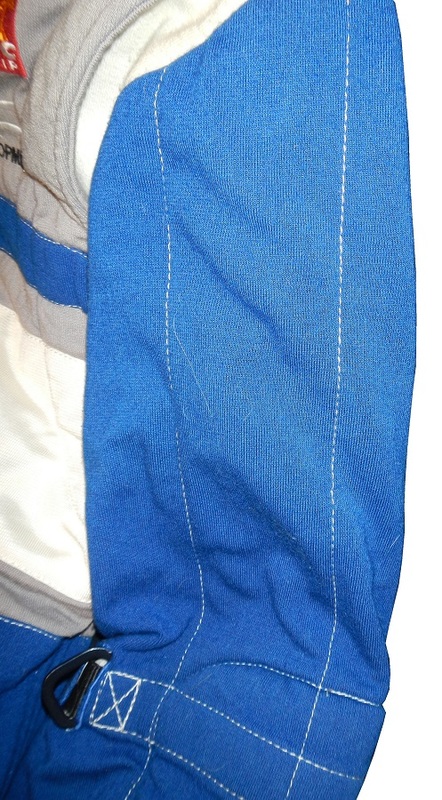 In addition to the damage to the pant leg, what strikes me about this suit is that the material seems so light. 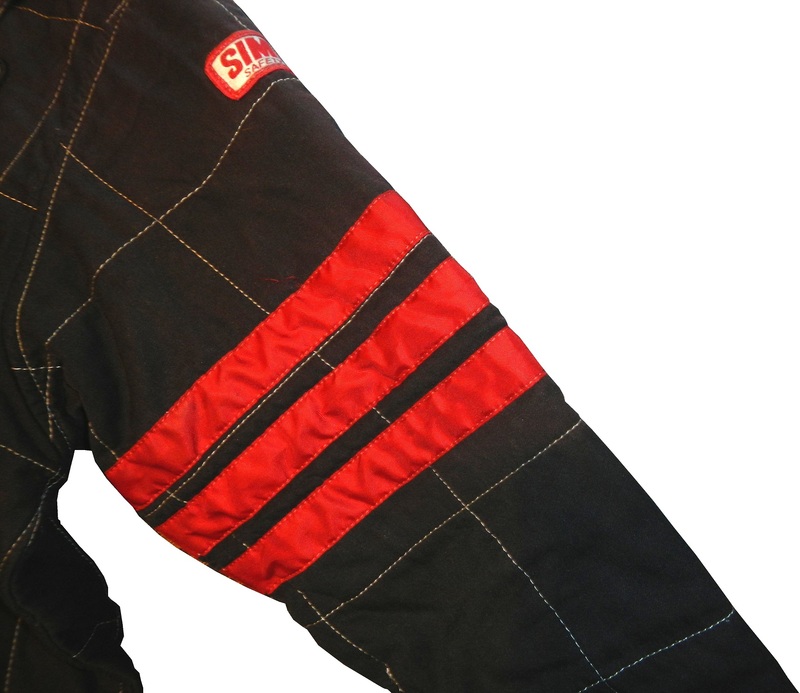 While it is safety certified, it does not feel like a Nomex suit. 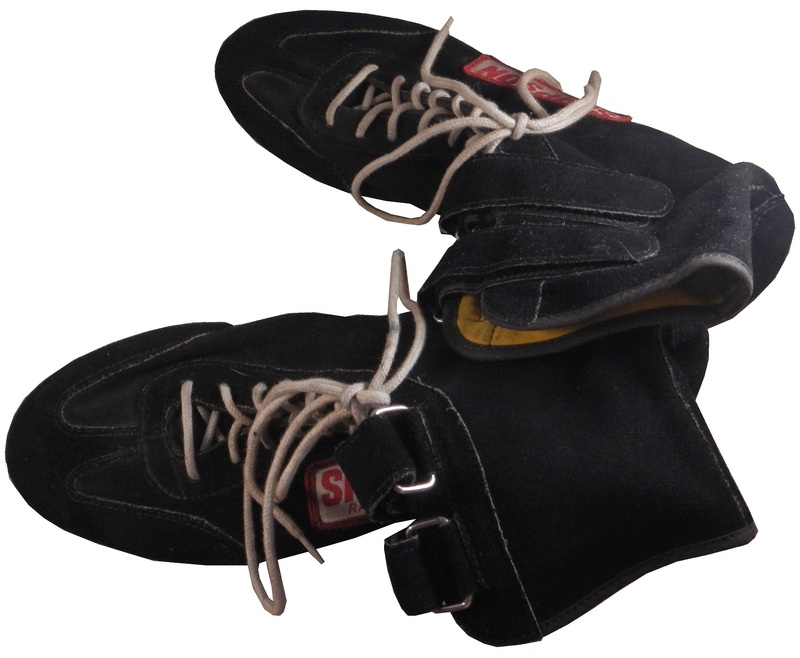 It is very light for a suit of its size. The suit is a two-piece and the jacket does not show as much wear as the pants, and I understand the reason. 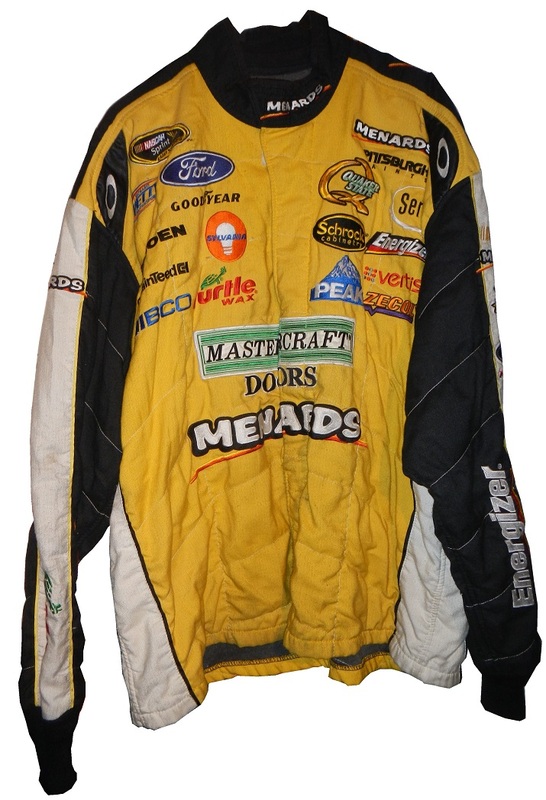 The logo about the Menard’s logo is for Mastercraft Doors. 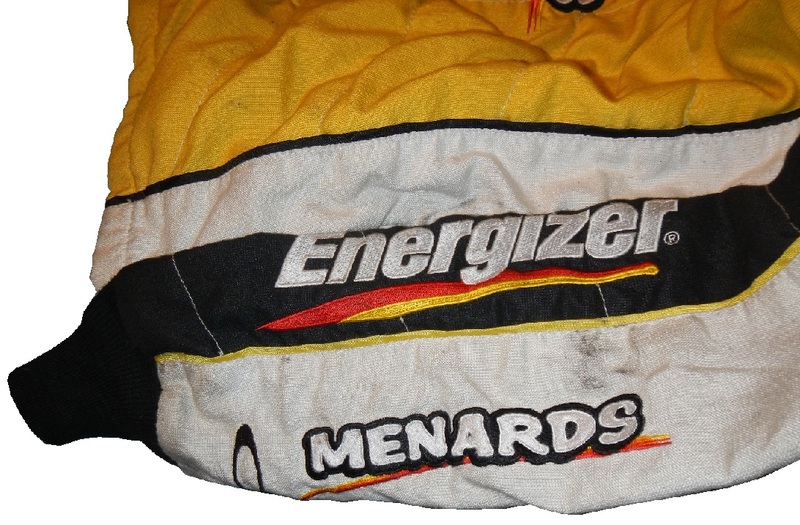 Paul Menard races with Menard’s on the quarter panel and a rotating set of sponsors on the hood. Mastercraft Doors was on the hood for 3 races in 2010, the Brickyard 400, the Carfax 400 at Michigan, and the Ford 400 at Homestead. 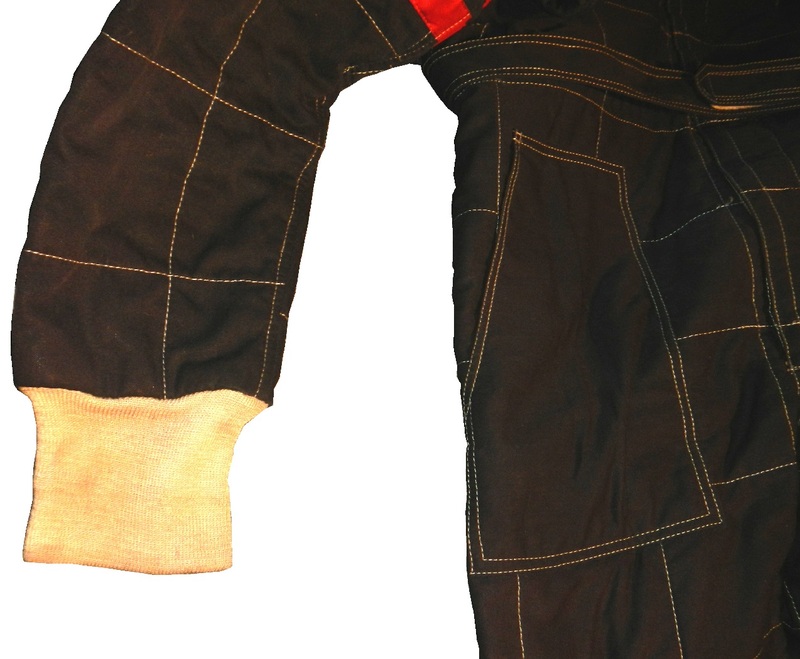 While the jacket doesn’t show as much wear, it does show some staining on the sleeves. 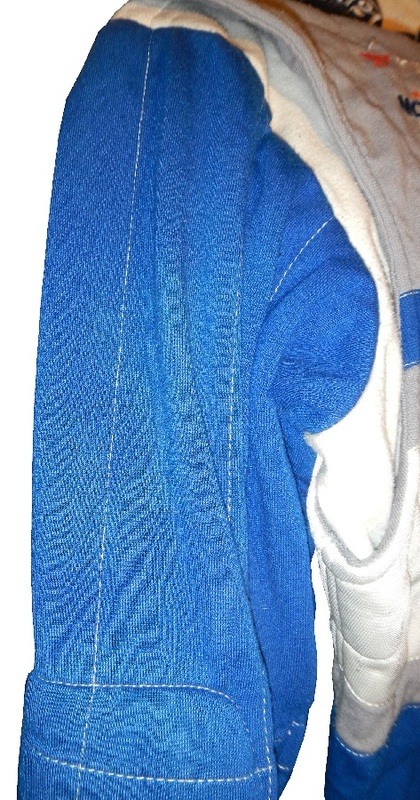 There are stains on the white area of the sleeves. 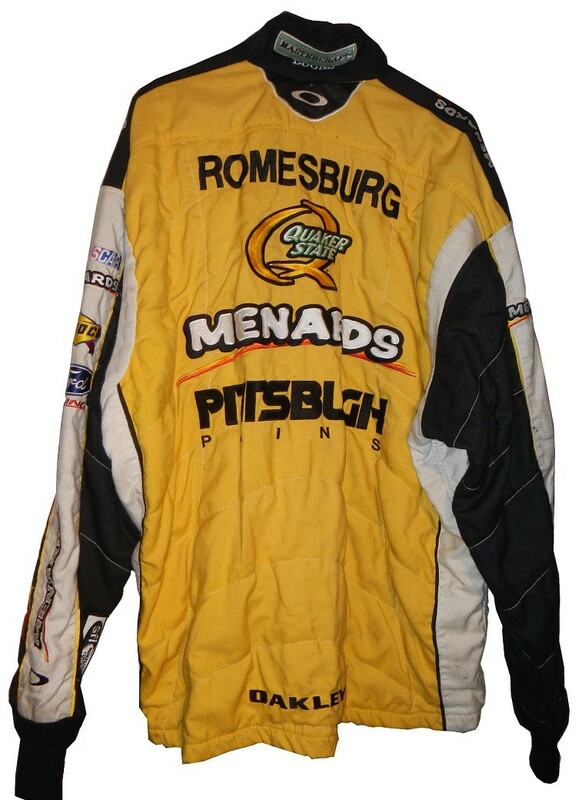 Since Romesburg was a tire changer, this is to be expected. 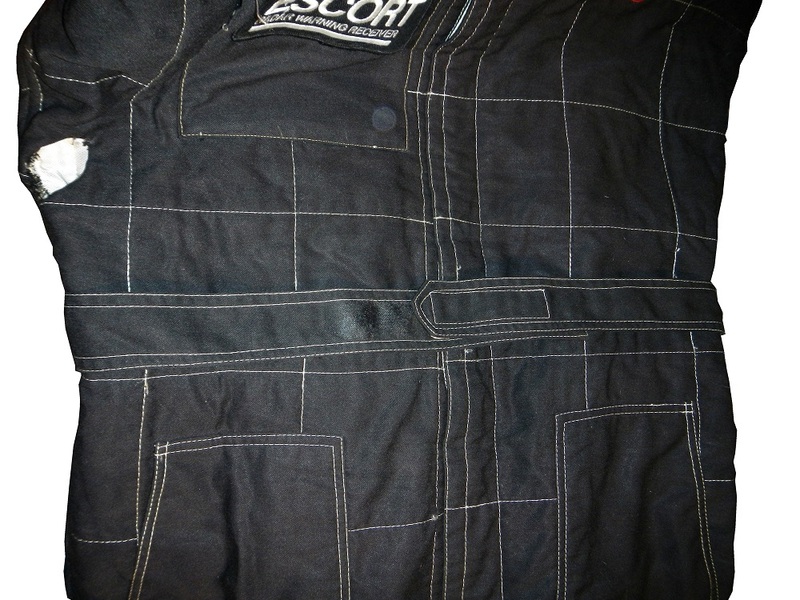 The two piece suit is very popular with pit crews because it has the same fire protection as a one piece but with less restriction than a one piece. 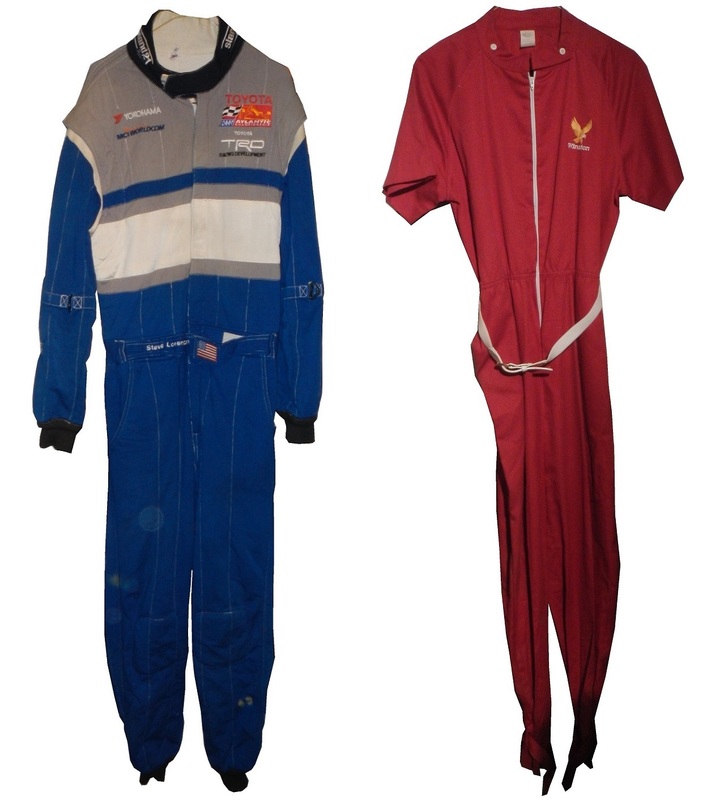 If you have ever worn a one-piece jumpsuit you know that it does restrict movement, as opposed to a jacket and pants of the exact same size. So when you are changing 4 tires in 14 seconds, you need every edge you get. 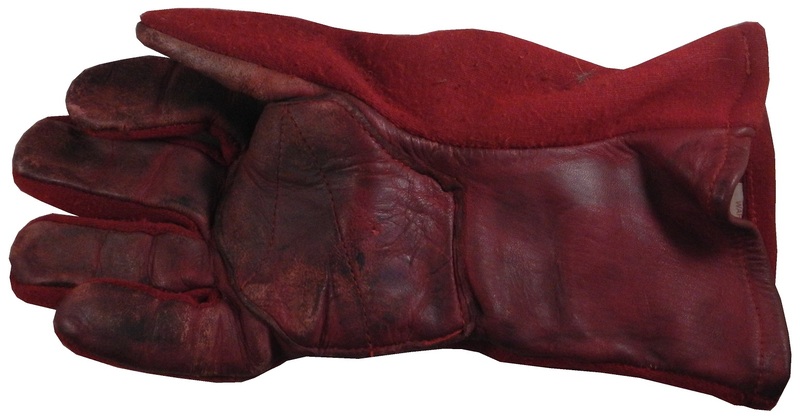 What I don’t see on the jacket are arm gussets. 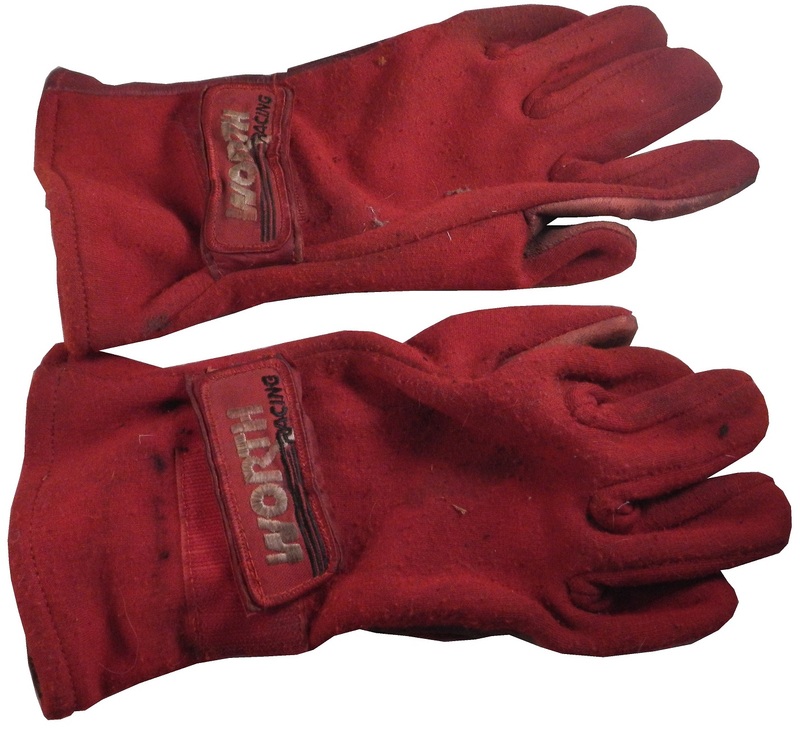 These would be used to add movement without subtracting fire protection. I have two theories on this, either the suit fit well enough that they weren’t needed, or because the crews were switching jackets so often that expense or time dictated that arm gussets couldn’t be used. 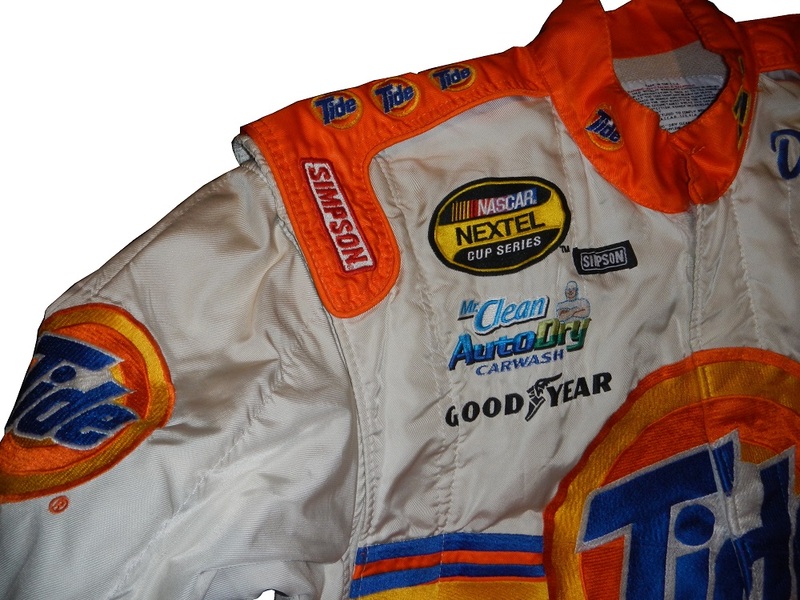 One detail I love are the television logos on the sleeves. 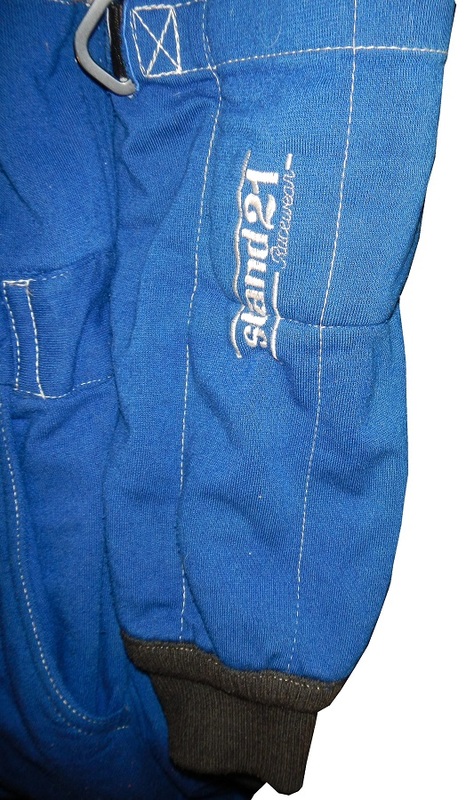 The dual logos on the sleeves look good and actually work well for both sponsors. The suit actually looks pretty good, but I do not like the quilt pattern on the legs, because it isn’t represented on the jacket, and it does look pretty odd in this respect. It does look like the two were designed and made by different people. 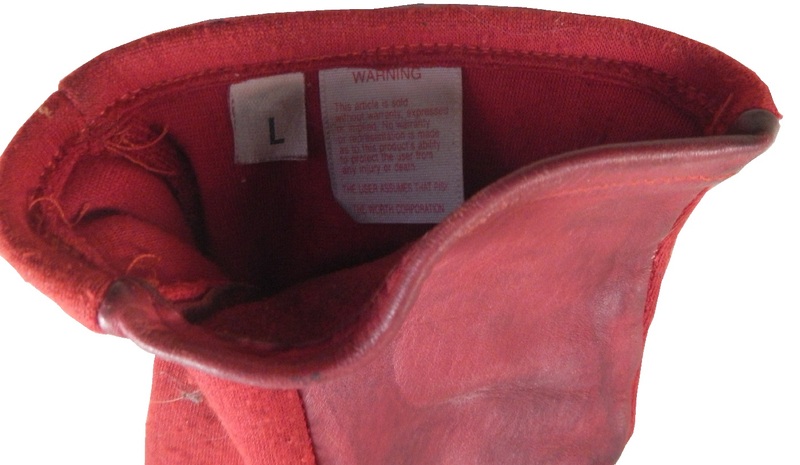 I’m also amazed by how lackluster the warranty label is… That is the shortest warranty label I have ever seen on a modern suit. 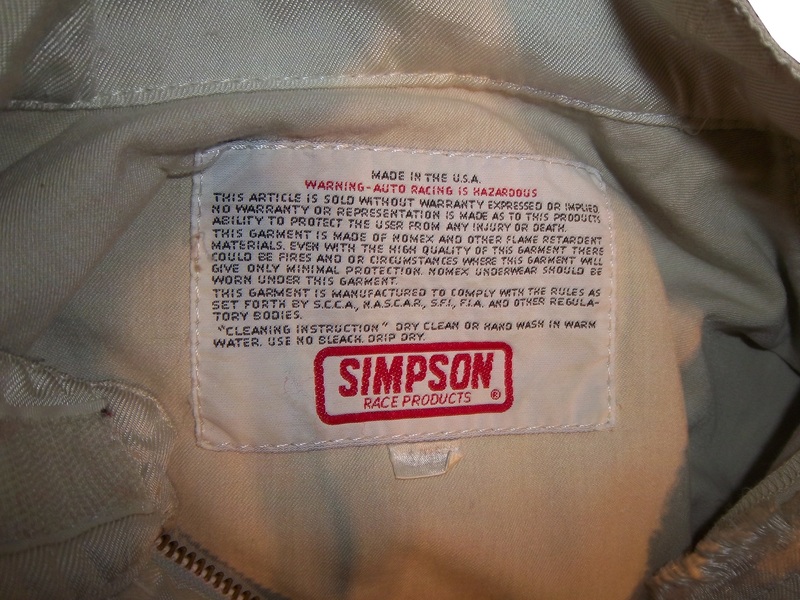 Let’s compare it to a Simpson tag… Wow that is a short warranty label, also, I don’t think a skull and crossbones don’t belong on this kind of suit, but it does say what it needs to say, just in a much shorter form than most driver suits. 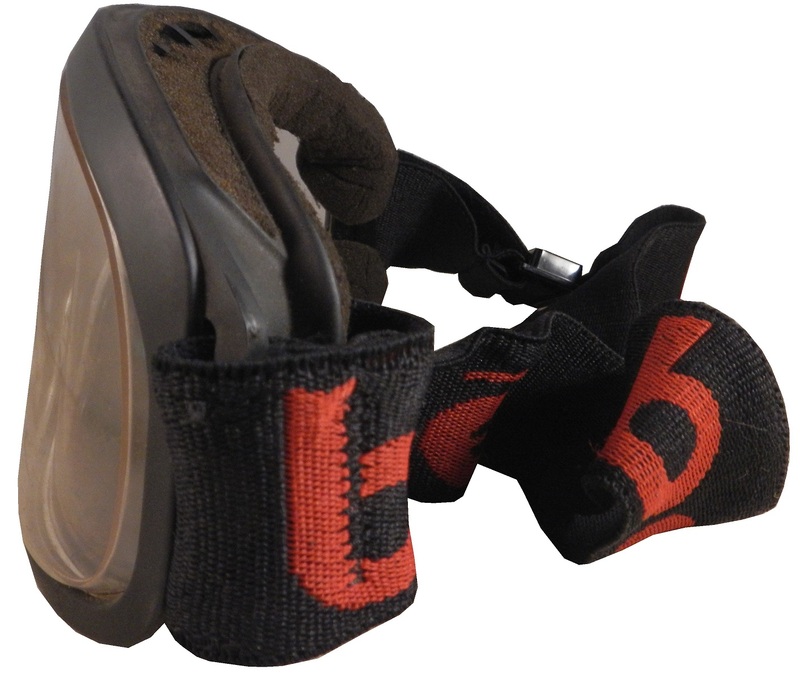 In short, Oakley is making decent suits, and they are doing what they are designed to do, protect the driver from fire. I think Oakley suit could catch with minor league racers, provided they start marketing them better. 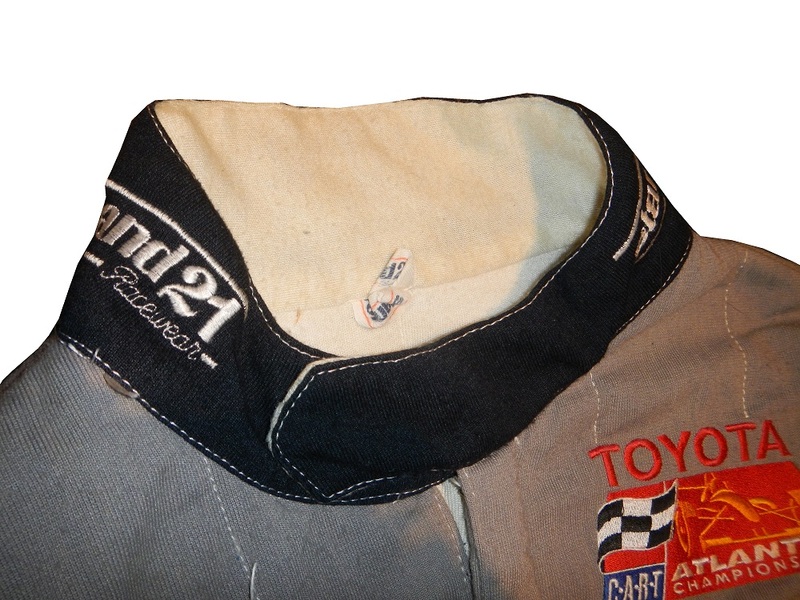 The fact that they don’t sell them through their own website, and provide more info on the drivers who wear their suits make it hard to sell them to the general public. Puma, which has a lot of talent on its roster too, does not want to sell through its own website. Why they don’t is a mystery, as there is a lot of money in these suits, and people will pay for high quality suits made by a reputable company. A collection of NASCAR, and NHRA Starting Lineup figures from the late 1990’s.